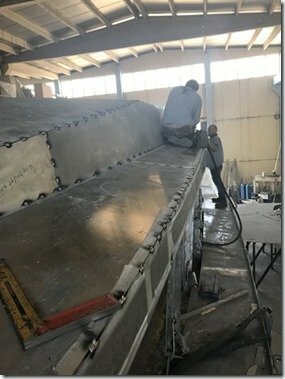 I am still out traveling so a bit delayed in putting together this weekly update for Sept. 17-21, 2018 and thanks for your patience. 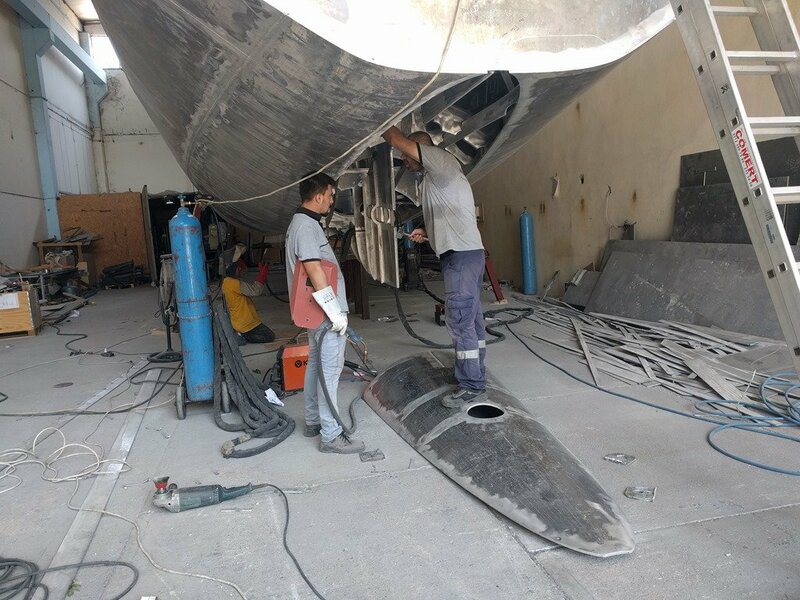 Thanks to Yiğit providing me photos from the yard I am able to put together this quick summary of this week’s work on mv Möbius. 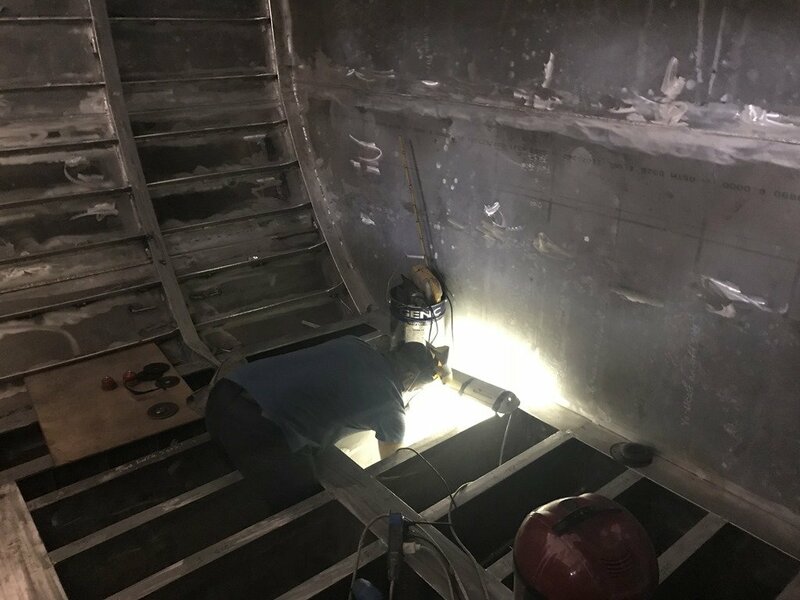 Primary focus this past week has been on building the superstructure for the above deck Pilot House and SkyBridge areas and the continuation of final welding of all the tanks, baffles, stringers and components on the interior of the hull. 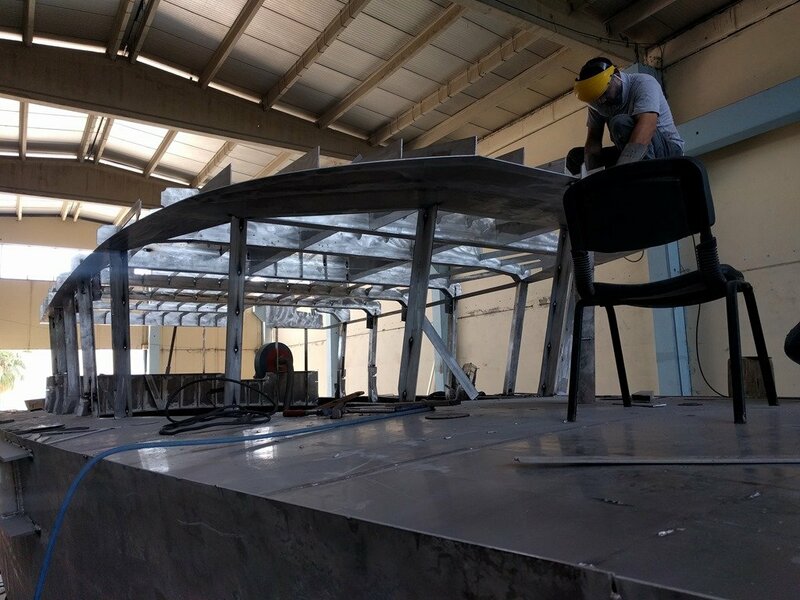 Let’s start up on deck with the progress Uğur and Nihat are making putting together the jig saw puzzle of pieces of aluminium that make up the Pilot House and Skybridge framing. As you say last week the upper parts of the frames making up the Pilot House have been tacked in place and followed by the plating of the front overhang where one bank of solar panels will go. A justifiably proud Uğur is now working his way along the sides of the upper outside of the Pilot House tacking all these plates in place. 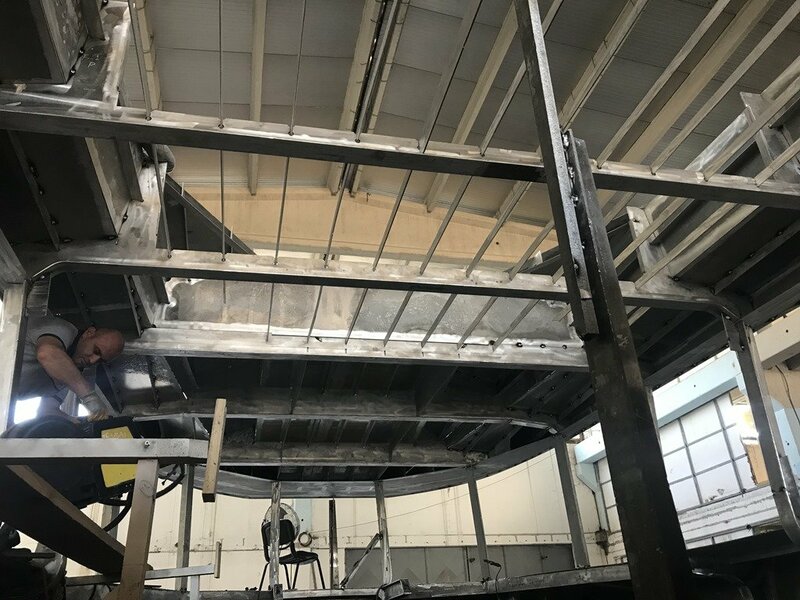 This shot is taken from inside the Starboard corner of the SuperSalon where the Galley will go looking over the aft Port side. The rectangular opening you can see in the photo above and in this next frame in front of it on the left will be plated to create the vestibule and headroom when you walk through the main watertight door leading from the aft deck and down the stairs into the SuperSalon. 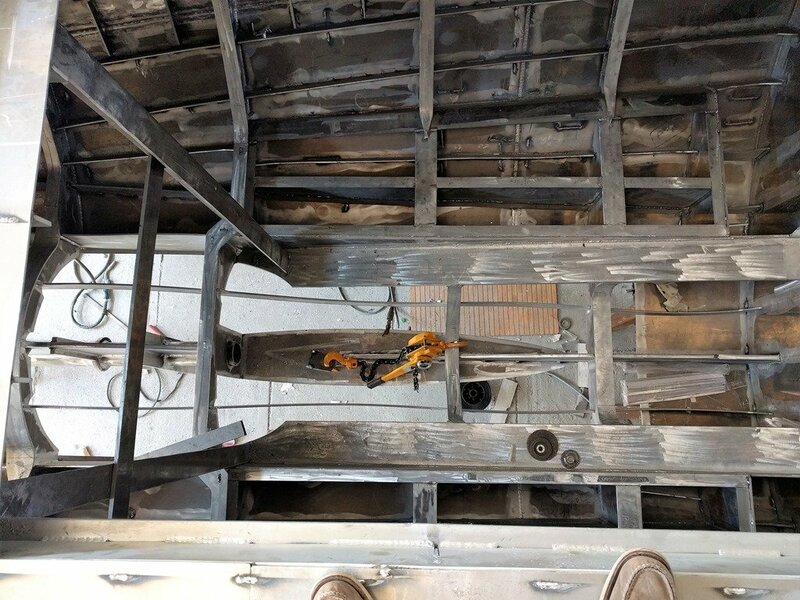 Standing on the forward Port corner of the Pilot House looking aft along the Port side deck you can see how the plating is quickly being tacked in place to form the roof overtop the framing. 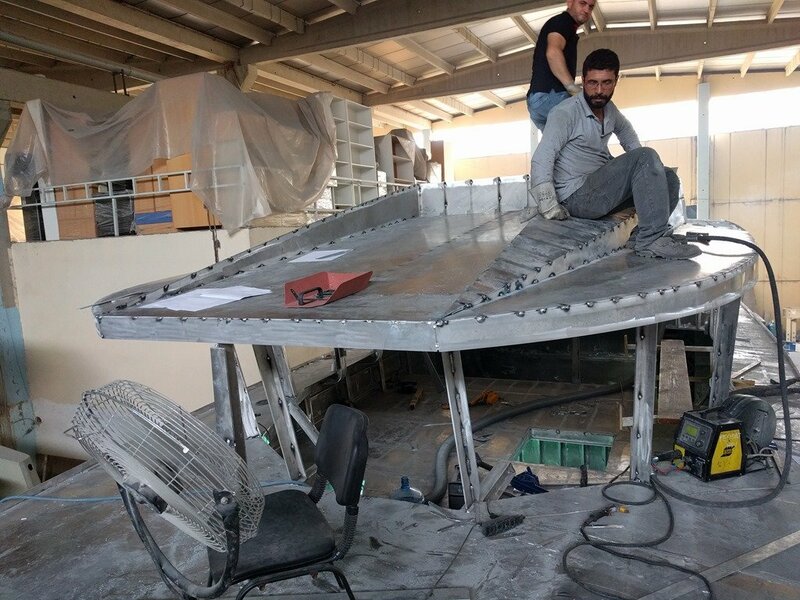 The horizontal portion you see Uğur sitting on is a bit like the eaves on a house and in our case provides a nice overhang above the side windows to help provide some shading and reduce rain on the windows. This area also provides convenient storage for our inflatable kayak while we are at anchor to keep is out of the water when not in use. Standing in the Port (left) aft corner of the SuperSalon looking forward as we see Nihat moving one of the MIG welders into the SuperSalon you can see how those side overhangs look from the inside. 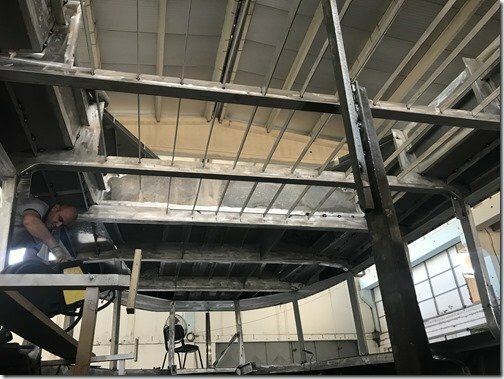 This view also shows the vertical window mullion posts which frame each sheet of very thick laminated glass and creates the 360 degree views from within the SuperSalon. 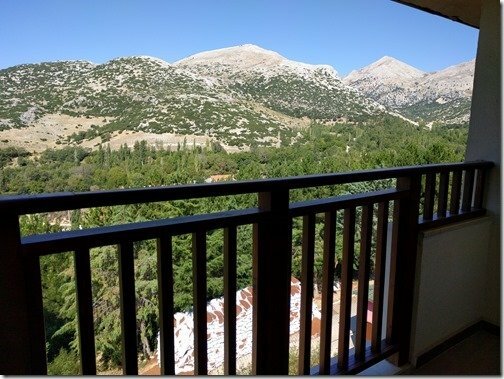 Doesn’t take too much imagination to see how fabulous the views will be from anywhere you are standing or sitting as you look out at the tropical island we are anchored off. 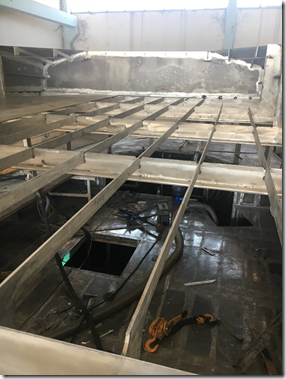 Moving up above the floor of the Skybridge you can see how the longitudinal stringers you see here and in the photo above have been inserted in their slots in the upper frames ready to have 6mm plates tacked in place to form the floor of the upper Skybridge area. 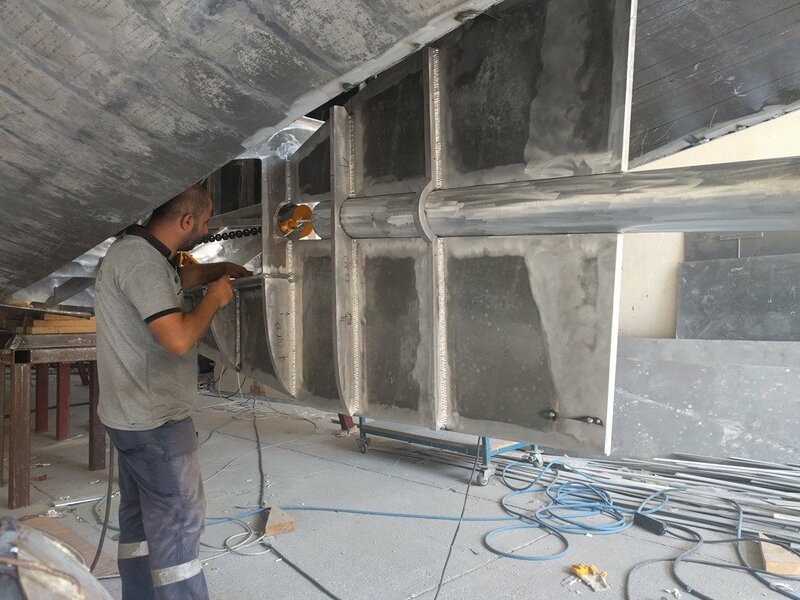 Next day you can see those SkyBridge floor plates have been tacked in place and Uğur is now fitting the inner plates which will form the lower walls or coaming enclosing the SkyBridge. 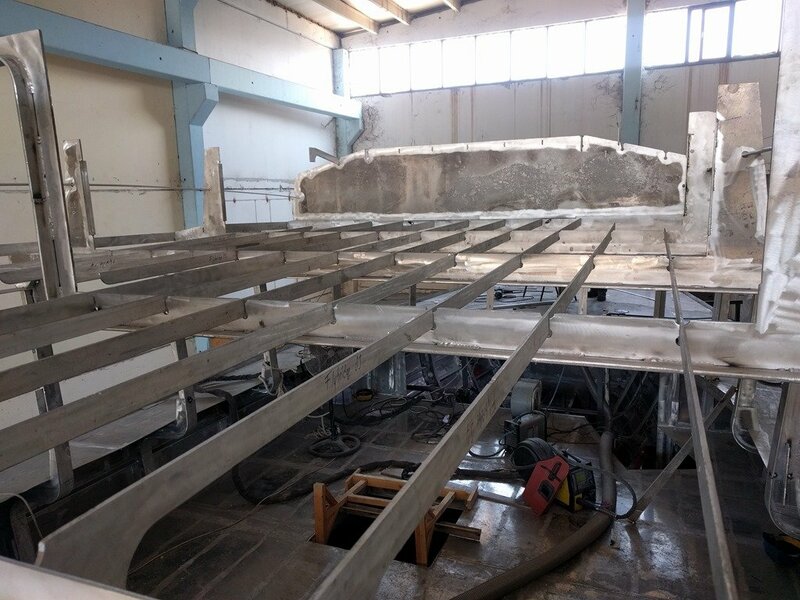 With all the framing in place the plating proceeds quickly and you can start to get a sense of how great a space this SkyBridge will be with its unobstructed and elevated views. There is a full helm station off to the left of this photo and I think this will be my favorite spot to con the boat from in all but the most inclement of weather when we can move down to the helm station in the front of the SuperSalon. 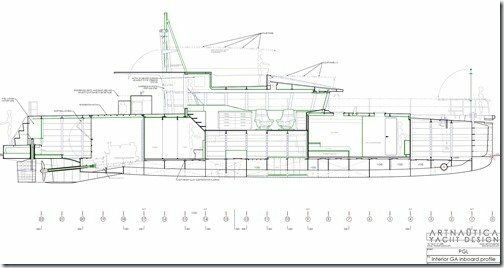 This quick render, click to expand, will give you a better sense for how the aft deck, SkyBridge and Pilot House are laid out. 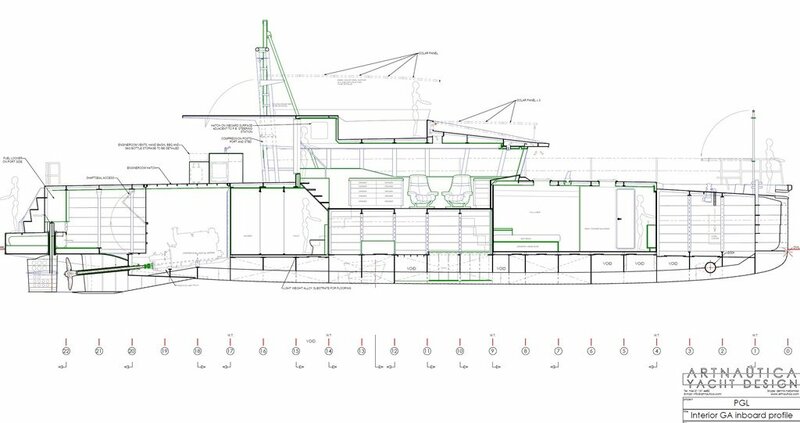 You can see the doorway on the aft Port (left) end of the Pilot House leading into the SuperSalon., the stairs up to the SkyBridge on the opposite Starboard side and the roof and solar panels that extends out over the aft deck. Moving back on the Aft Deck looking forward you can see the initial superstructure that extends aft from the end of the Pilot House. 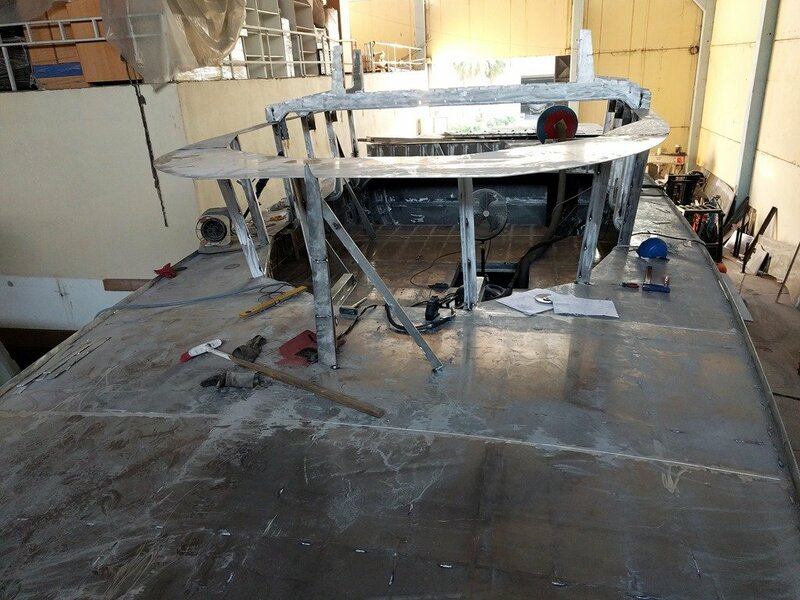 This creates a nicely protected area where the stairs go up on the Starboard (right) side into the SkyBridge and then also create a roof over the aft deck area to provide shade and rain protection for our BBQ area on the aft deck. 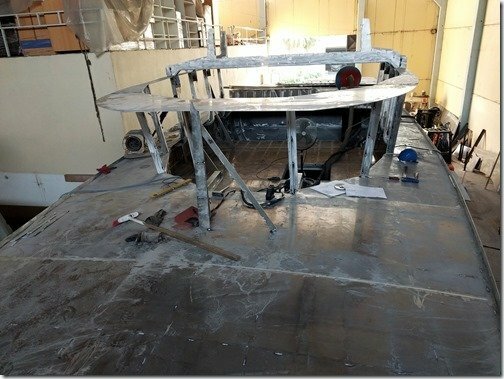 Looking a bit more to Port you can see the beginnings of this aft deck roof. 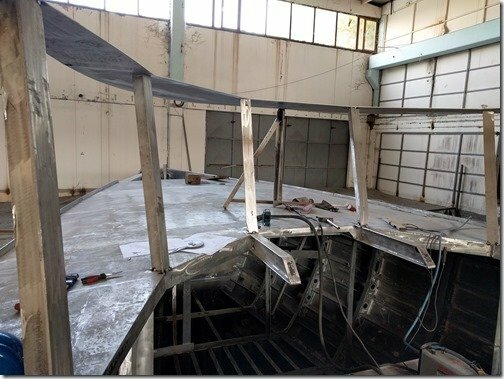 It will also provide a great surface for our third bank of solar panels, the other two being atop the SkyBridge roof/bimini and the roof overtop the front of the Pilot House. 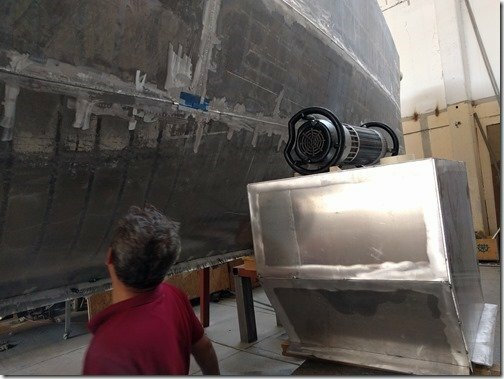 It is difficult to photograph but a tremendous amount of work is taking place inside all the water and fuel tanks that form the entire bottom of the hull below the waterline. Each of the 14 individual tanks have lots of baffles within them to prevent the free surface effect, the technical term for “sloshing” of these liquids when we are underway. And each baffle needs to be fully welded along all three edges and on both sides so it adds up to a LOT of miles of welding. 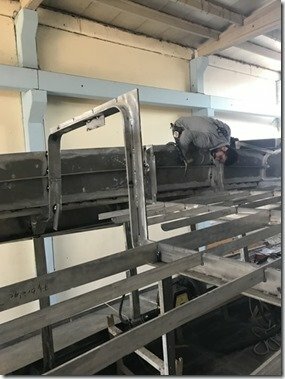 And as with all welds these need to be cleaned both before and after the welding so Mehmet is constantly looking after this. No video for you this week I’m afraid so this will have to do for now. I will be out out travelling for another 2 weeks but I will do my best to get this week’s progress update posted over the weekend. Thanks again for choosing to join us on this adventure and as always, please add y our comments and questions in the “Join the Discussion” box below. 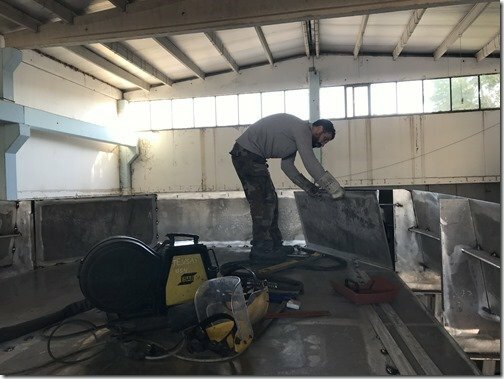 Standing on the aft deck looking forward through the Pilot House this is about where we left off last Friday and now Monday morning Uğur and Nihat are setting the upper part of one of the rear most frames of the Pilot House/SuperSalon. 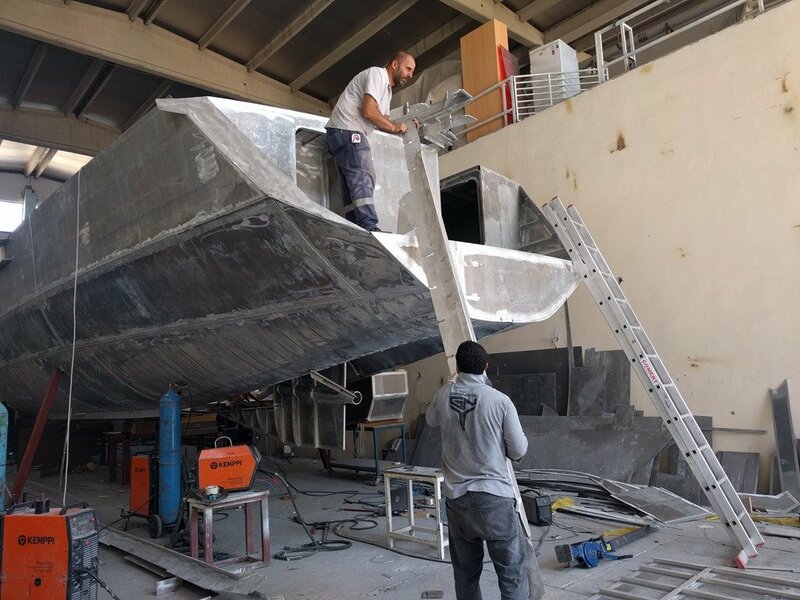 The plinth on the left by Nihat is to provide plenty of headroom when you enter from the aft deck down the stairs into the SuperSalon. 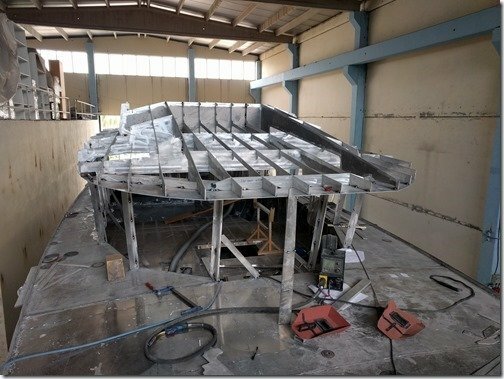 The last frame that forms the aft end of the SuperSalon is raised next and you can see the entry into the interior very clearly now. 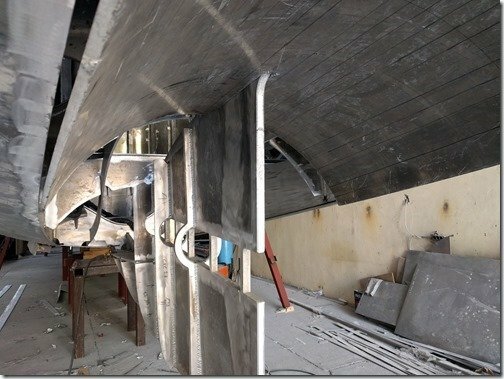 The cut out on the right is where the exterior winding stairs take you up the SkyBridge atop the Pilot House. 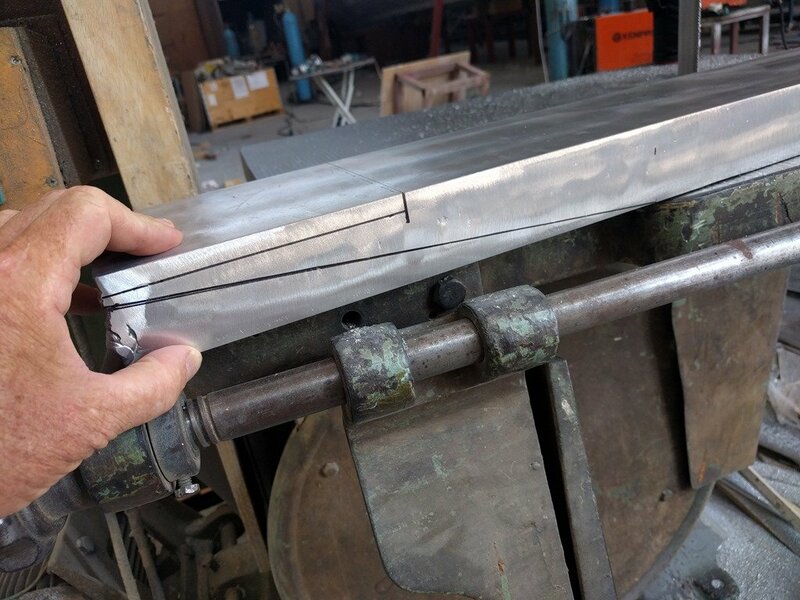 We are quite liking the random swirl pattern you see here formed by a brass wire wheel to create the final finish on all the external aluminium which will stay bare and unpainted. What do you think? Moving up to the front deck looking aft now you can see the rest of the upper frames are now tacked in place anxiously awaiting their longitudinal stringers to be fitted into all those slots and create the support structure for the AL plate that forms the ceiling of the SuperSalon and the floor of the SkyBridge. The expanse of horizontal AL plate you can see here and above is the brow of the Piot House which helps keep the sun and rain off the front negatively raked windows below. There will be a similar overhang extending all the way down the sides windows as well. 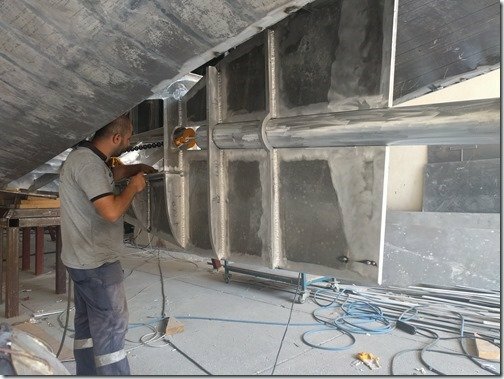 Standing on the floor of the SuperSalon looking up through the front center window here to show you another reason for this large overhang which is to assist with our passive ventilation. Spending most of our time at anchor we always have a nice breeze coming over the bow and when that hits these negatively raked front windows it creates a very useful positive pressure point and hence these vents on the underside of the overhang to use that pressure to bring plenty of fresh air into the boat. 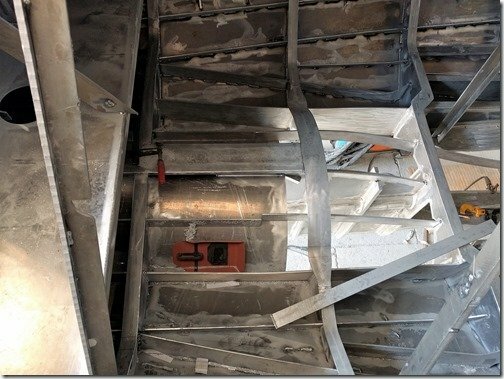 After passing through these vents the air flows into the box section created by the paneling all around and then we have four large vertical AL pipes in the open area you see above to direct the air down into the front area of the SuperSalon where the main Helm Station is. With our interlocking “kit” style of construction the assembly happens quite quickly as it is a simple matter of sliding each stringer into its corresponding slots and then once all the jig saw puzzle pieces are in place and the whole assembly is checked with alignment lasers just to be sure all dimensions are correct, each joint is tacked in place in preparation for final welding and the addition of the covering plates. 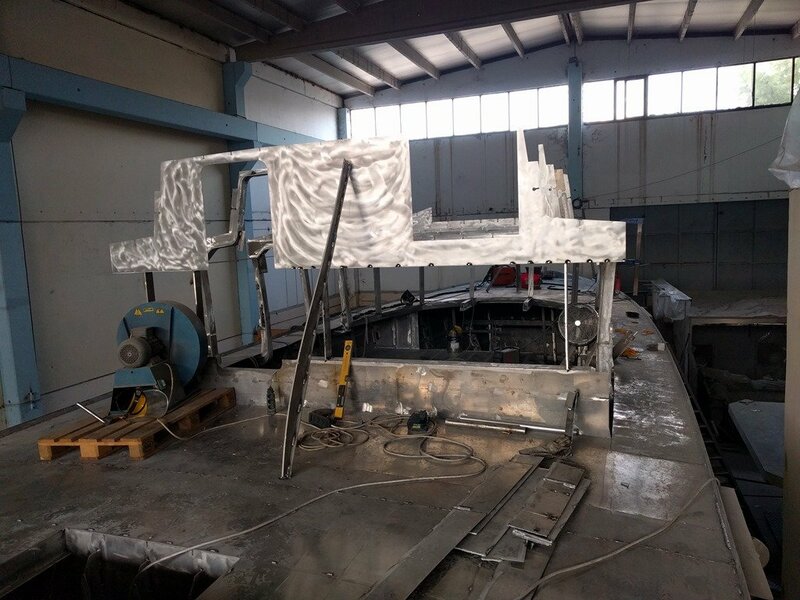 This slightly different angle lets you see the tack welds locking the whole assembly in position. 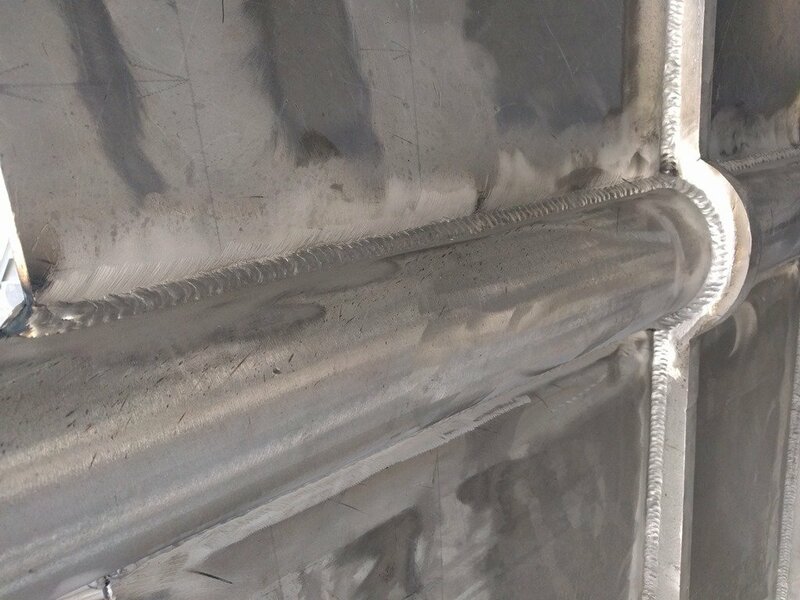 Not that front vertical bar you can see on the far left here and above is a temporary brace from when the horizontal brow or overhang plate was initially placed to ensure that it is the right height and brace it until all the final welding is complete. 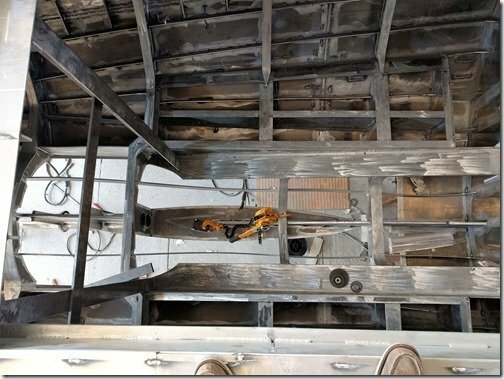 Standing on the aft deck again looking through the opening where the stairs end and you walk into the SkyBridge you can see how the ceiling/floor framing works. 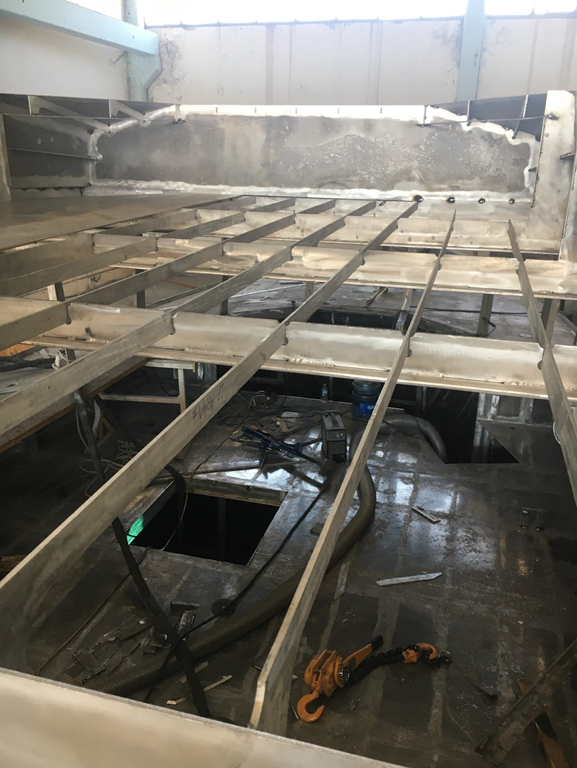 The short vertical wall marks the front end of the SkyBridge and the plate you can just see in the bottom left corner is the aft end so it is a very good sized space 5.3m/7’4” with perhaps the best views on the whole boat being up higher and having an unobstructed 360 degree view. 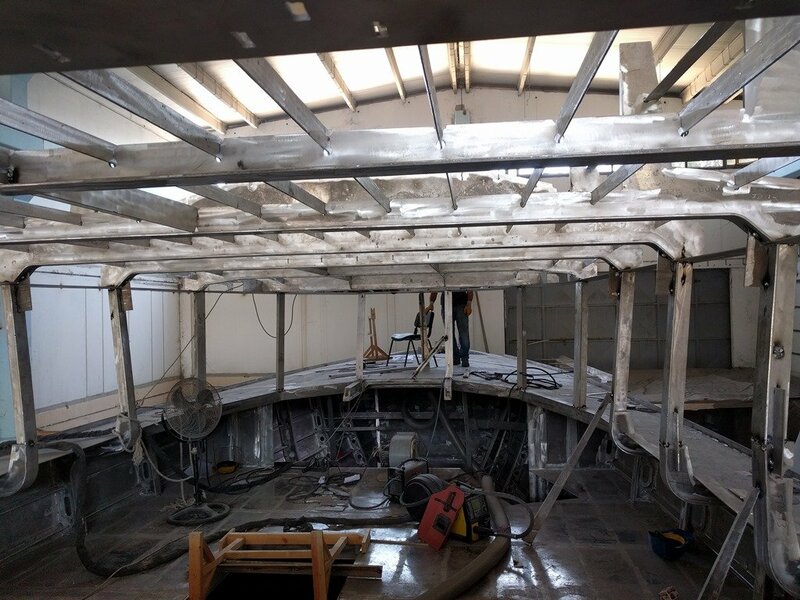 Stepping down into the aft Starboard (right) corner of the SuperSalon where the Galley will be you can see more of the ceiling framing and get a sense of scale for the whole SuperSalon area. With all our aluminium parts delivered already CNC cut to precisely the right shapes the plating does not take long to be fit into position and tacked to the underlying framework. 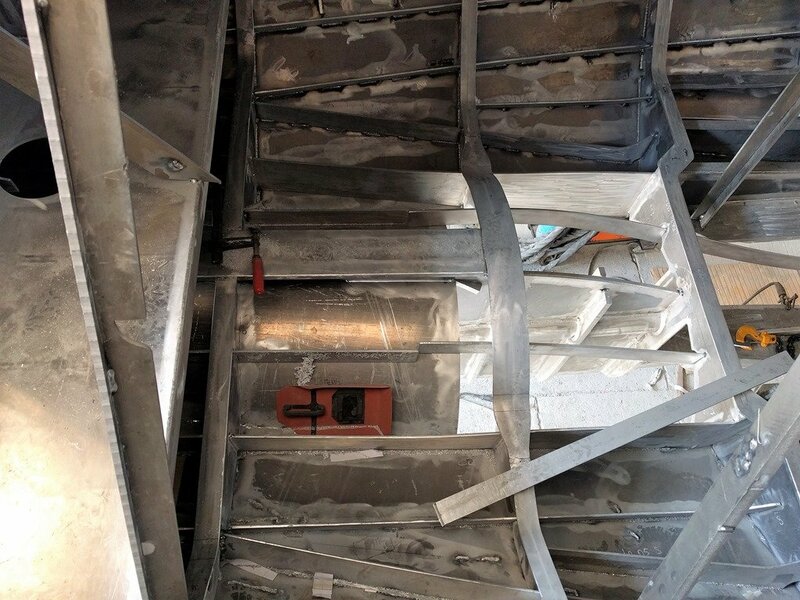 The large recessed area running the full length of this front section of the Pilot House roof serves two very important functions. 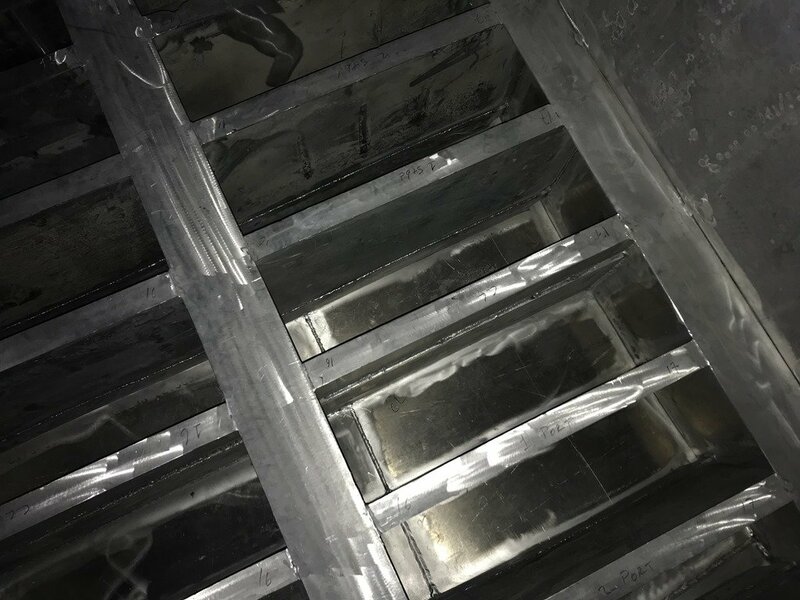 First a rack holding four large solar panels will fit in between the triangular vertical side walls and be hinged at the very aft end atop those vertical bars you can see here. When on passage this large expanse of solar panels will be locked in place with the forward edge tight against the forward end of the roof overhang and then when we anchor this front edge will be lifted up about 200mm/ 8” so they are horizontal and generating lots of power to keep the house battery bank well charged but also performing their second function which is to funnel more of those beautiful breezes blowing aft from the bow. 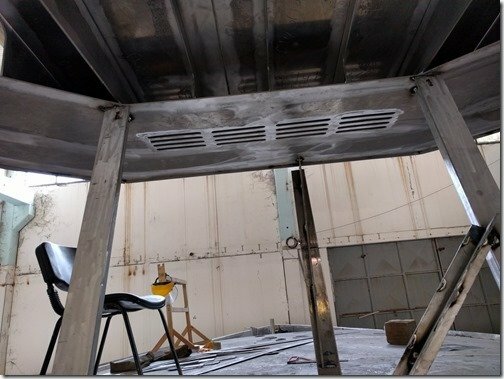 As with the vents you saw above on the underside of the overhang, these breezes will flow into the boxed in area behind those vertical bars and then down into the center of the SuperSalon ceiling through three large 300mm / 12” diameter aluminium tubes. 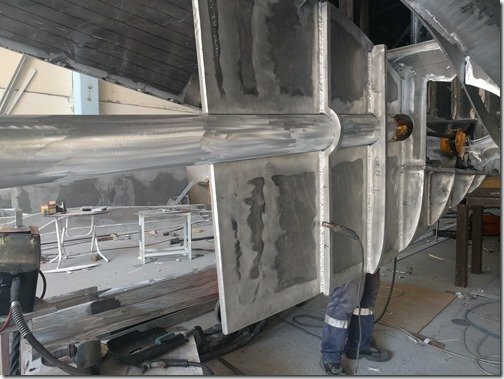 Both the smaller tubes up front and these large tubes aft will have adjustable vents in them, similar to the “eyeball” type vents in many cars dashboards so you can adjust the direction and amount of air flowing through. 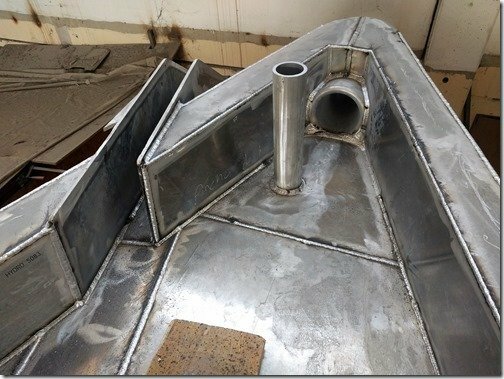 We think this combination of vents to capture the breezes almost always blowing over the bow will provide more than enough fresh air throughout the boat in most conditions. However the vent boxes will also have very quiet fans inside which can augment the air flow if there is just no breeze and in very hot conditions we can also turn on the AC. Uğur is about 180cm/ 5’9” tall so he will give you a bit of sense of scale for this front area of the Pilot House in front of the SkyBridge. 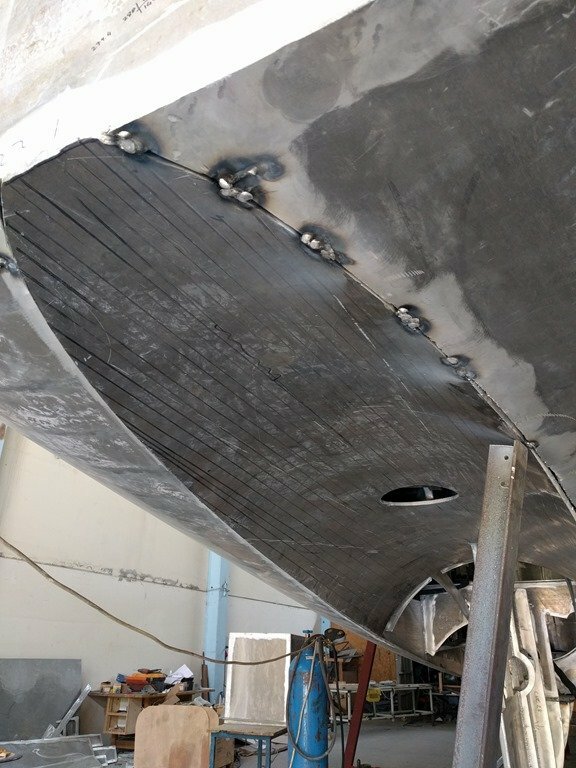 This is about where we left off on Friday afternoon with this front section now all tacked in place. 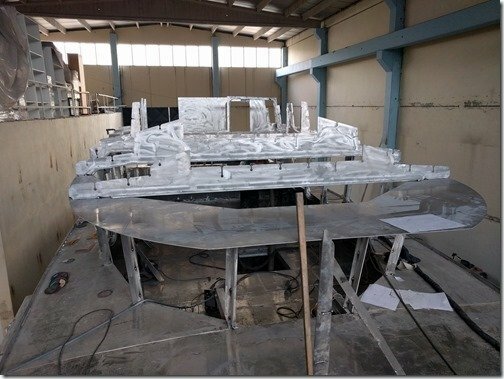 A very visually exciting week as the real Möbius morphs from virtual 3D models into very real full size aluminum shapes. Video summary as per usual is below for you to get an even better sense of all that happened this past week. I am going to be traveling for the next 3 weeks to the US, Canada and Brazil for a combination of some friends and family time and a keynote down in Sao Paulo in memory of a dearly departed friend and colleague. 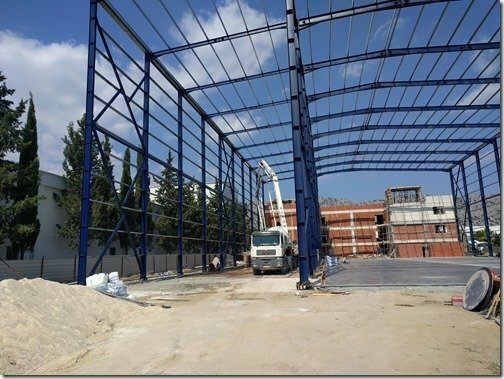 However Yiğit our new CAD engineer has kindly agreed to step in and take pictures and video while I’m away so I will do my best to keep posting a weekly summary for you and I’ll now be anxiously awaiting his pictures just as eagerly as you. Thanks for coming along on this exciting adventure with us and please add your comments and questions in the “Join the Discussion” box below this post. See you next week. 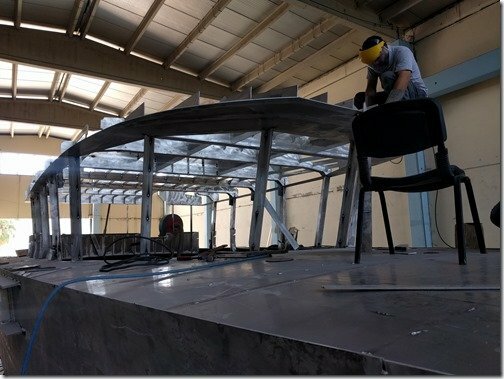 This week Team Möbius made great progress on both on the bottom and the top of the hull of the hull. 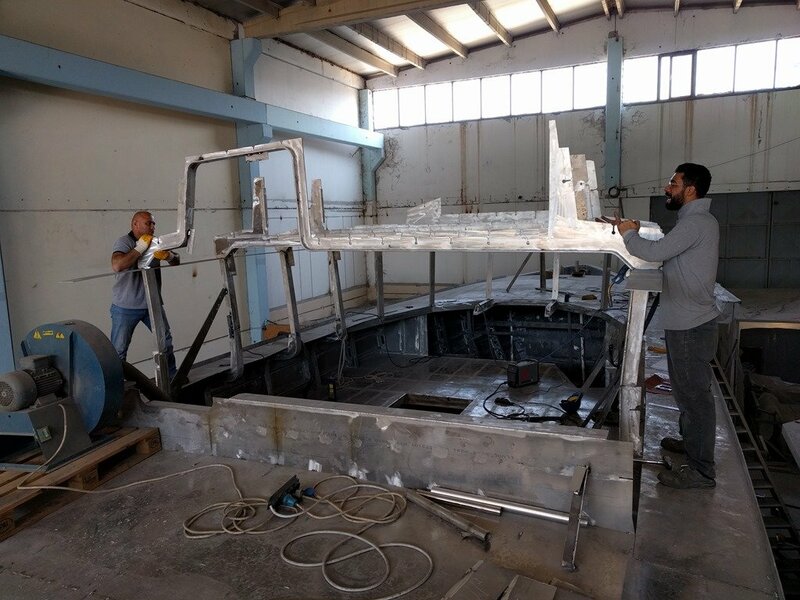 On the bottom Sezgin and Mehmet continued in what must seem to them as the unending miles of welding since all the hull plates have been tacked in place. 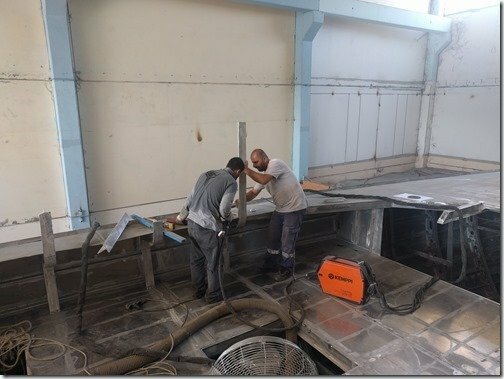 Joining them on the floor Enver and Umit were busy completing the fin shaped skeg which houses and supports the propeller shaft. 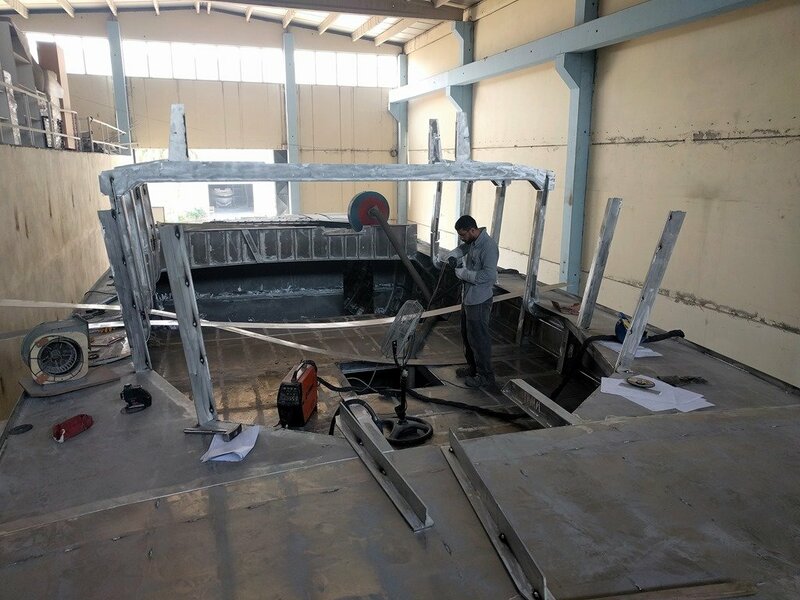 Meanwhile up on top Uğur and Enver were busy setting the first frames that make up the superstructure for the above deck Pilot House which wraps around our primary and largest of the three interior living spaces, the area we refer to as the SuperSalon. 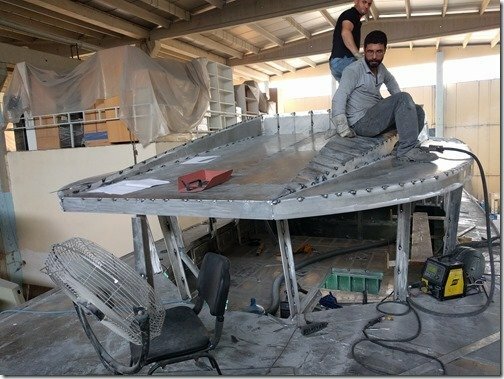 This superstructure creates an eXtremely strong monocoque like cage that provides the framing for the 360 degrees of glass windows which wrap around the entire SuperSalon and the roof creates the floor for the SkyBridge above. 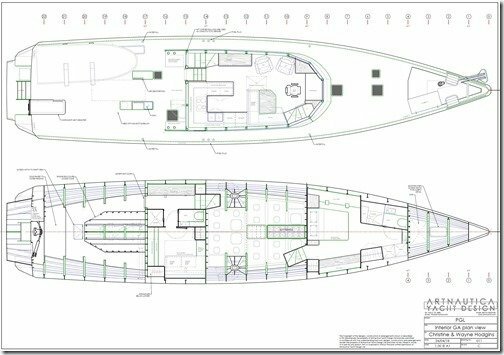 The SuperSalon contains our Galley, Dining table and Lounge areas as well as the main Helm Station at the front and the stairs leading down to our Master Cabin forward and Christine’s Office/Guest Cabin aft. But enough already Wayne! Let’s get on with the pictures and video. This foil shaped fin on the bottom aft end of the hull is what is called a Skeg and it helps a bit with keeping the boat tracking straight much like the fin on a surfboard but its primary roles are to protect and support the propeller shaft where it exits the boat and enters the water and to provide protection to the propeller and rudder aft from any debris that we might run over. 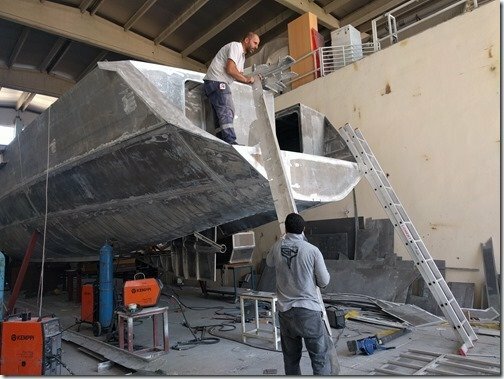 Seasoned sailors know from first hand experience that it is not IF you are going to run aground but when. 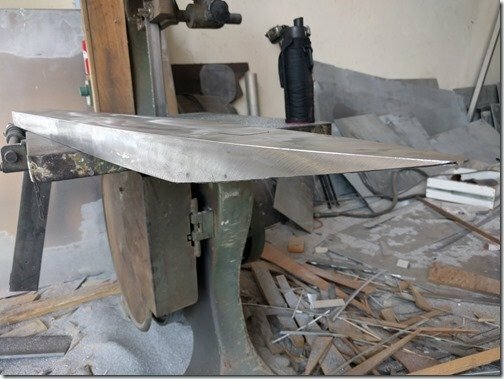 The 50mm / 2” thick “shoe” you see in these two photos will be welded onto the bottom of the Skeg and add even more strength to the massively over engineered Skeg. The bottom of the Skeg is also the lowest point of the boat so this is where the boat would first contact the bottom and we have built it to be eXtremely strong to be like the old Timex watch jingle “It can take a licking and keep on ticking”. The center of the skeg is a continuation of the 25mm/1” thick keel bar that runs down the center of the entire length of the hull and the temporary support webs you’ve seen in previous posts have now been cut away so that the 15mm thick aluminium tube you see here can be slid in place. 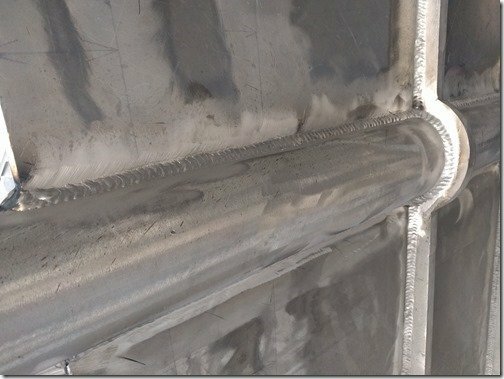 Looking aft you can see how this aluminium tube has been pressed through the thick support webs and tacked in place. Once the hull is all finished and we are fitting the engine and CPP propeller system, the CPP prop shaft log which is another tube containing the prop shaft, bearings and seals will slide inside this tube with about 12mm / 1/2” of clearance between the two tubes. Once the engine, CPP gear box and prop shaft have all been perfectly aligned the space between the two tubes will be pumped full of special “ChockFast” epoxy and form an eXtremely robust and well aligned propulsion system. 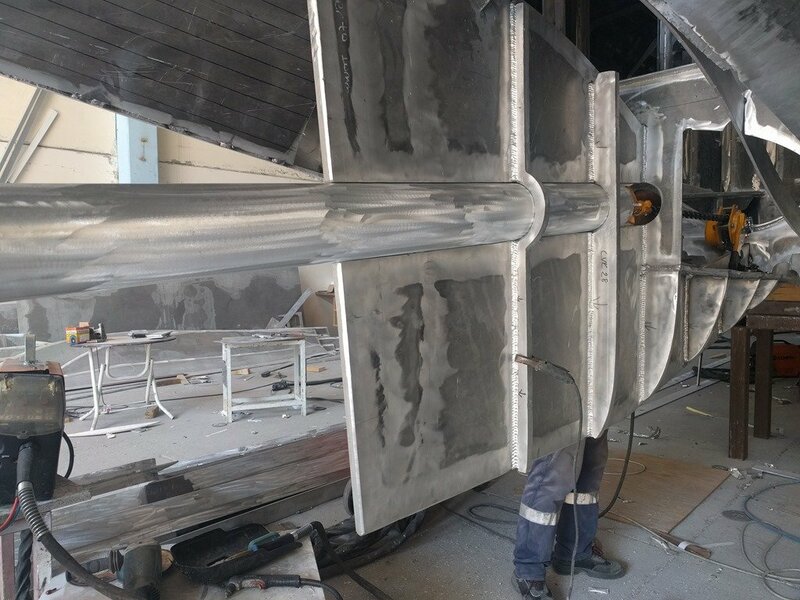 We call Sezgin away from welding the hull plates to lay down these beautiful welds to complete the prop tube installation and get ready to fit the thick plates that will form the slick foil shape of the Skeg. Climbing up onto the aft deck to get this shot looking down into the Engine Room clearly shows a sectional view of the carefully chosen foil shape of the slippery skeg (under the yellow chain hoist). 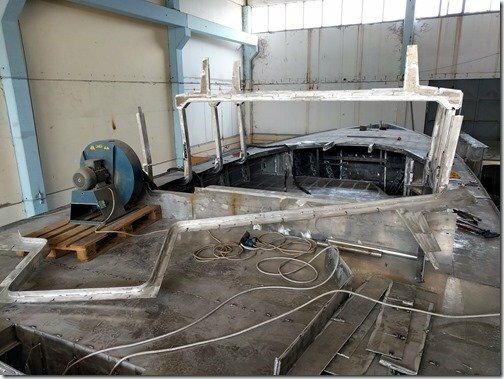 The two 25mm thick beds for the engine and CPP mounts are running horizontally on either side of the Skeg and if you look closely (click to enlarge) you can see the end of the prop tube where it enters the Engine Room on the left. 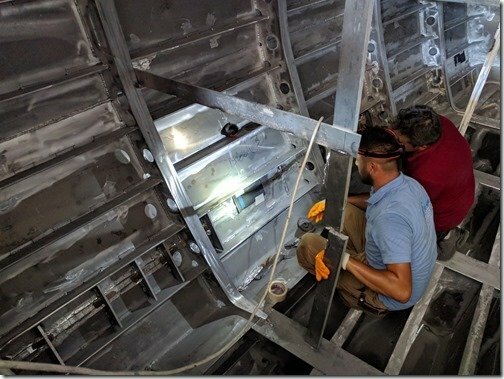 While I’m up here, this shot looking a bit further aft into the Workshop area behind the Engine Room shows the arc of the prop tunnel from the inside. 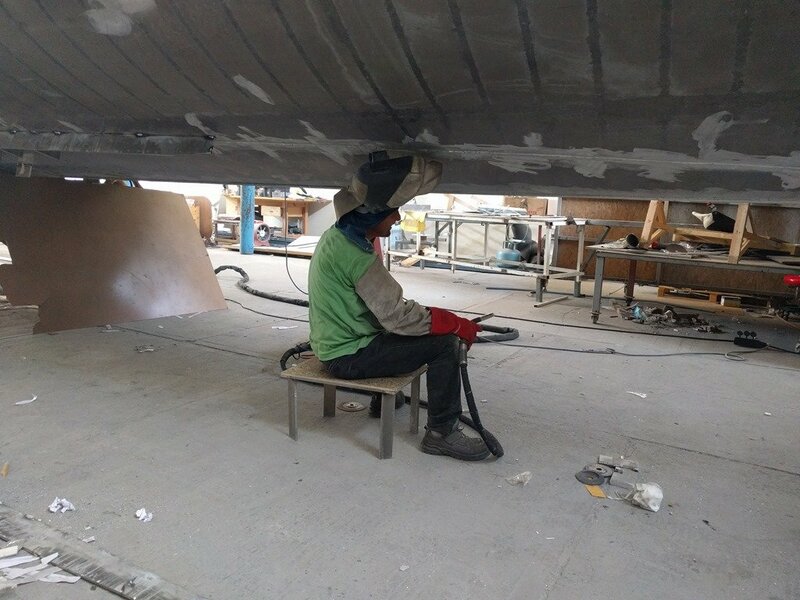 Further forward Sezgin our Master Welder continues his non stop welding of the 15mm/ 5/8” thick hull plates. 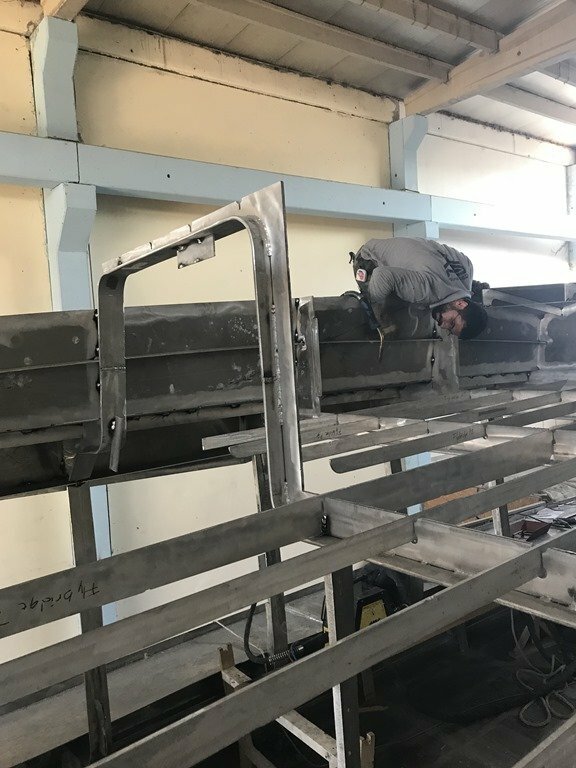 Mehmet works both before and after Sezgin to initially prep all the areas to be welded by grinding them clean and well recessed and then follows up by cleaning the thick final welds which Sezgin has laid down. 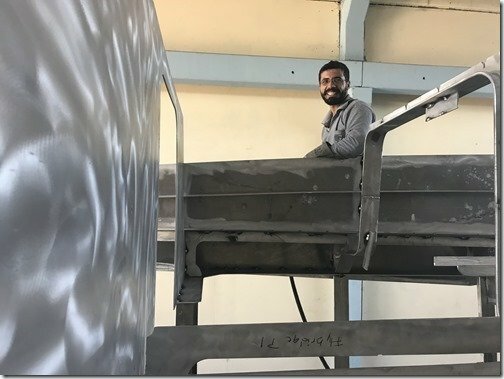 They are certainly getting a workout now that much of their work has to be done overhead but they are always smiling and enjoy seeing all their great progress. Back at the stern there is new action as Uğur passes some of the previously welded assemblies up to Enver on the Swim Platform. Wonder what they could be for? 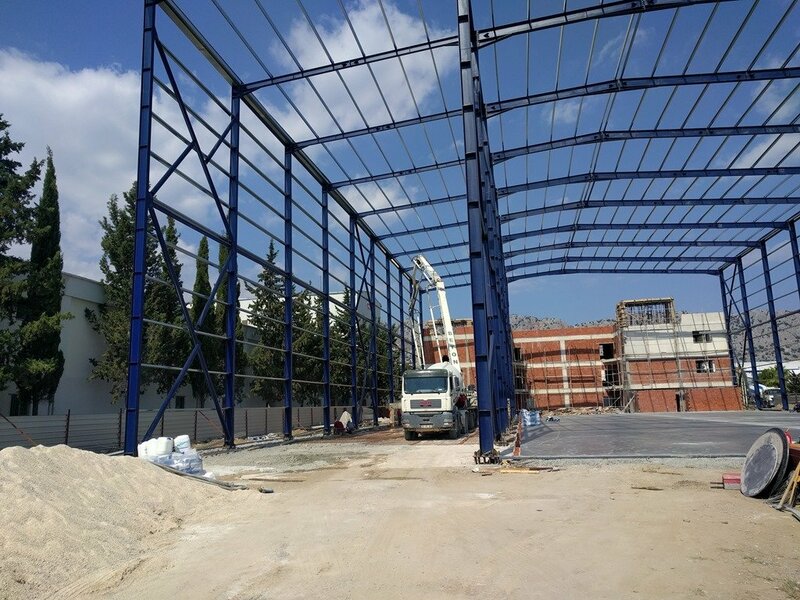 Ahh yes, the truly super structure that wraps around the SuperSalon. First they carefully align the vertical I beams with the stub ends of the hull frames that were welded in as part of the first phase of building the hull when it was upside down. You can see two of these stub ends behind Ugur’s back to the left side here. A (blue) digital readout level is used to get the angle just right as they tack each part in place. 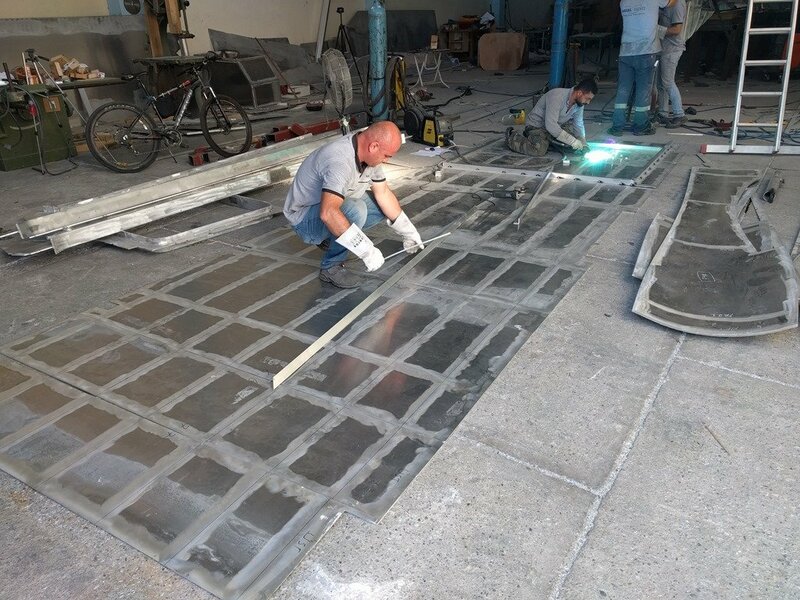 Once the vertical I beams are all tacked in place the upper component of each frame is set in place using the CNC scribed lines to align them just right. The frame in the foreground is the aft end of the SuperSalon with the WT door to the steps leading inside with the Galley on the Starboard/Right side. Moving up to the foredeck looking aft through the SuperSalon, Uğur is prepping the long plates that will form the underside of the roof overhang of the SuperSalon and getting ready to tack the front window mullion posts in place. 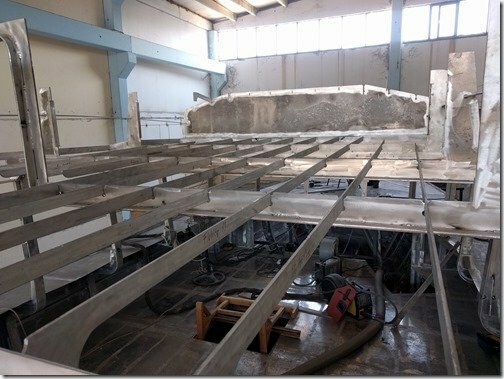 The four vertical posts up on top of the frames are the beginnings of the framing for the coaming that runs around the SkyBridge atop the SuperSalon. 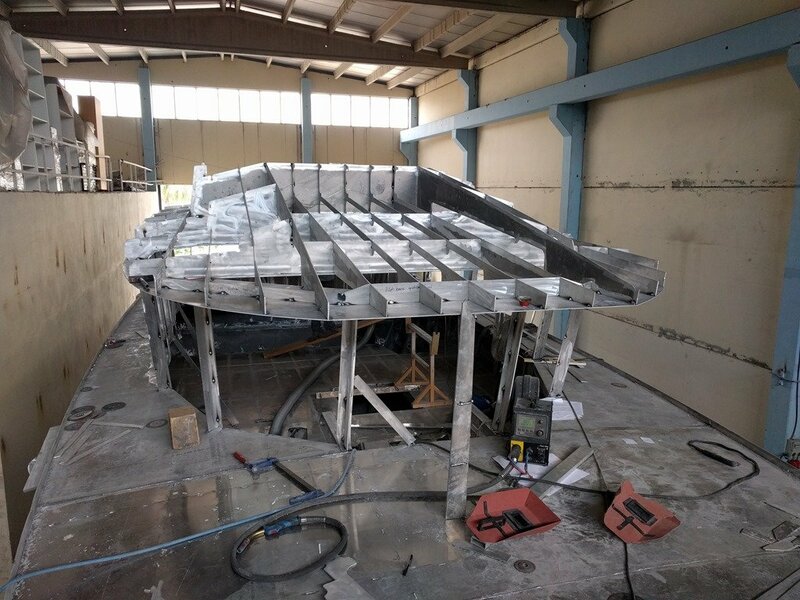 Doesn’t take him long to get the latest pieces of this giant jig saw puzzle tacked in place and the final shape of Möbius continues to emerge. You can see how all the windows are negatively raked, bottom in further than the top which is a feature we picked up from all the Pilot Boats we visited and pretty much eliminates reflections on the inside and reduces the rain drops on the outside. Hopping down into the SuperSalon I can now check out this view from the inside. 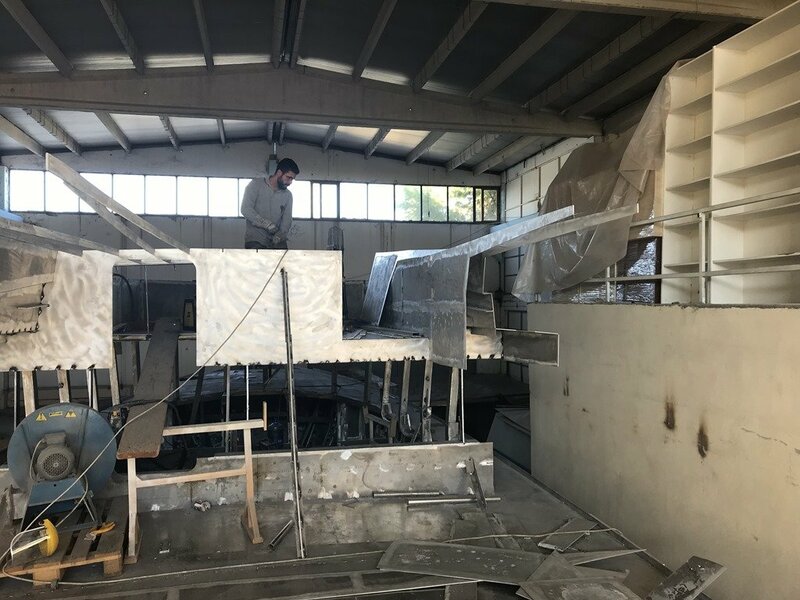 Can you imagine what this will look like when we are in some lovely little anchorage with nothing but tropical turquoise seas and beaches outside all these windows! We sure can!!!! 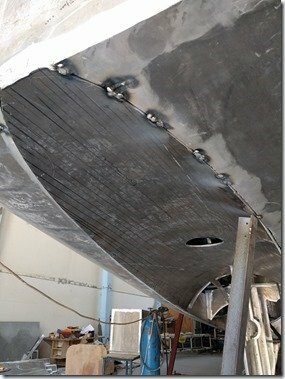 While I’m up on deck thought I would show you the progress up on the bow. The “side slinger” anchor roller assembly on the left, Samson post in the center and the big nose cone at the front. 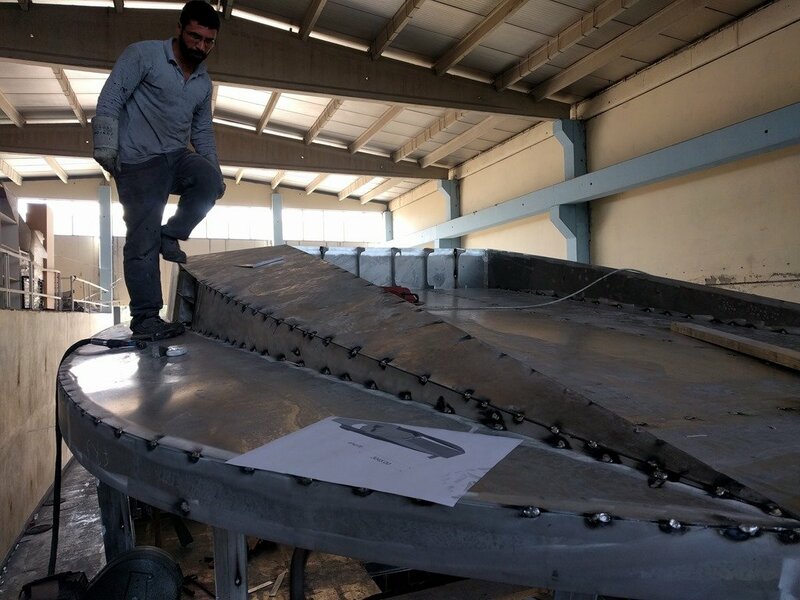 Sezgin has finished welding up the inside area round the snubber nose cone. 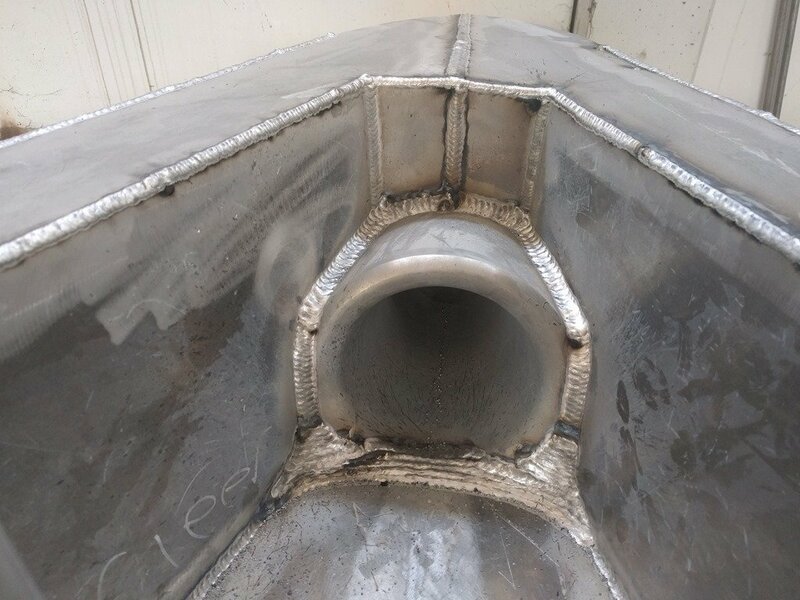 All the welds exposed above the waterline will eventually be carefully ground flush and smooth to create a uniform and smooth surface. 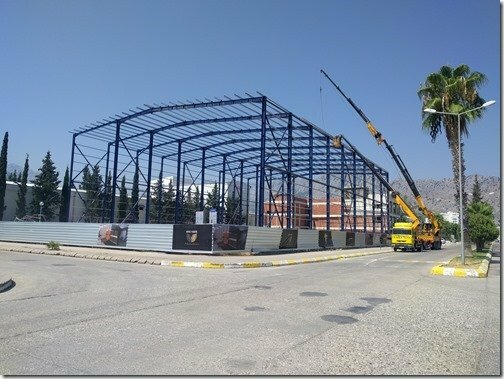 And just before we go, a few photos to give you a quick update on the equally great progress being made a few blocks away here in the Antalya Free Zone with the building of the new Naval Yachts shipyard. The ubiquitous crane trucks are being kept busy as the framing for the shipyard building goes up. 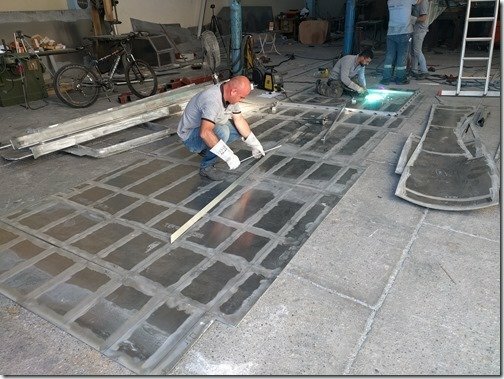 And concrete trucks and pumpers continue to arrive with the first of the slab floors going in place here. 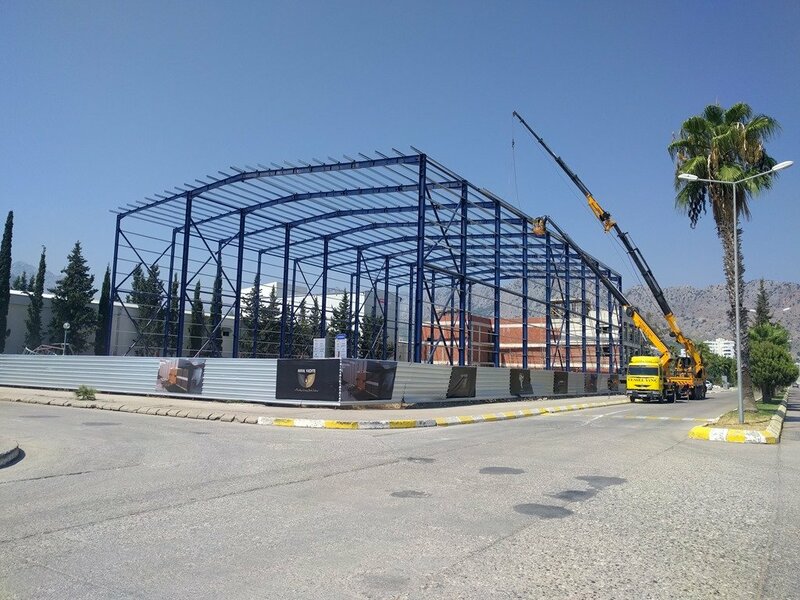 If this progress continues the hope is to move into the new facilities next month! As always we’ll finish up with your reward for getting all the way through yet another of Wayne’s posts with a quick time lapse video summary of this week’s progress. Thanks for joining us and be encouraged to add your questions and comments in the “Join the Discussion” box below. 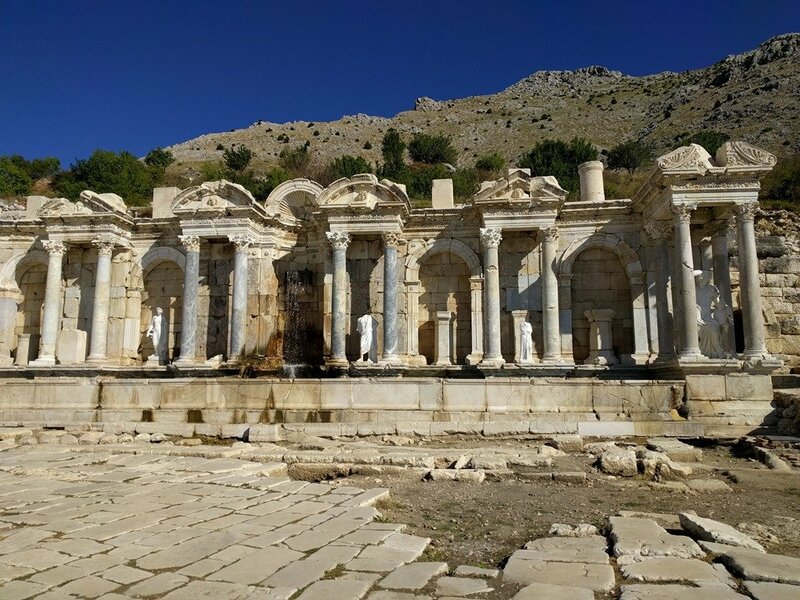 All of us on Team Möbius had last week off as it was the big holiday for the 5 day Hajj pilgrimage to Mecca for the Muslim world so Christine and I seized the opportunity to go eXplore more of the many sites surrounding us here in Antalya Turkey. I put together THIS separate post with pictures of our week’s adventures in this post if you’d like to see more of the awemazing sites we saw. This week it was back to the shipyard at Naval Yachts and back to work for all of us and more time to get to know our way around Möbius now that she is right way up at last. 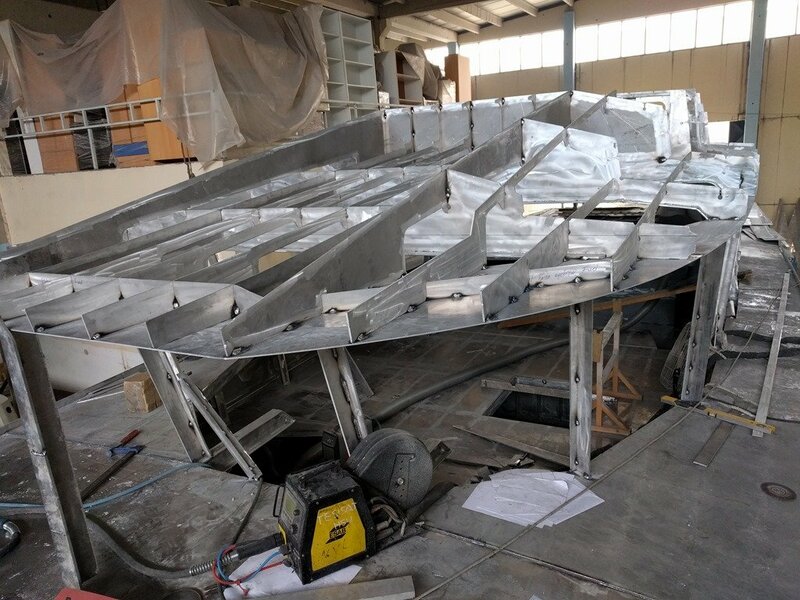 I have some pictures of the week’s progress but I shot a series of videos to take you on a bit of a guided tour through all the spaces on Möbius now that she’s right side up and hope it will give you a better sense of the layout and scale of our soon to be new home. The last remaining area of the hull needing to be assembled is the prop tunnel and skeg and this rendering shows what it will look like when finished. 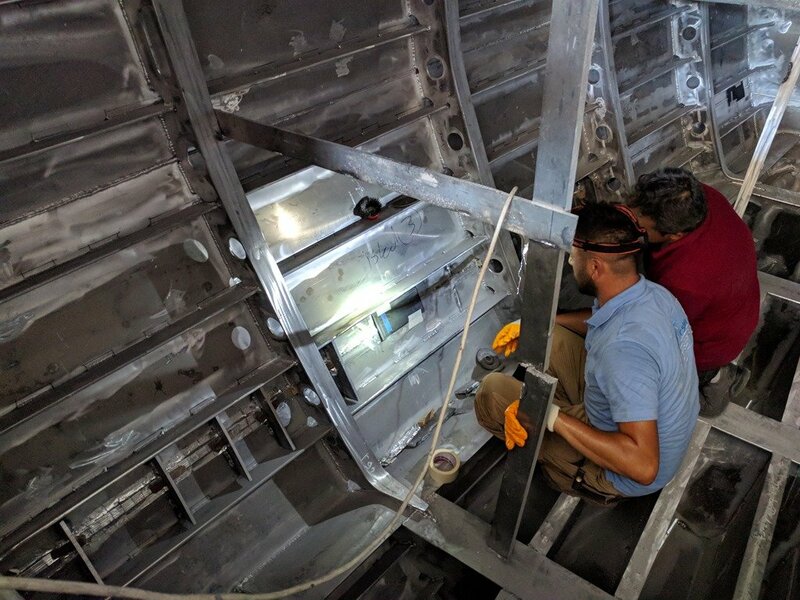 Enver is standing on what will be the aft section of the prop tunnel as he and Umit complete the welding and preparation of the 25mm/1” thick frames where this 15mm/ 5/8” tunnel plate will be inserted. The large hole by Enver’s foot is where the 225mm/ 8” diameter aluminium rudder tube will be welded. 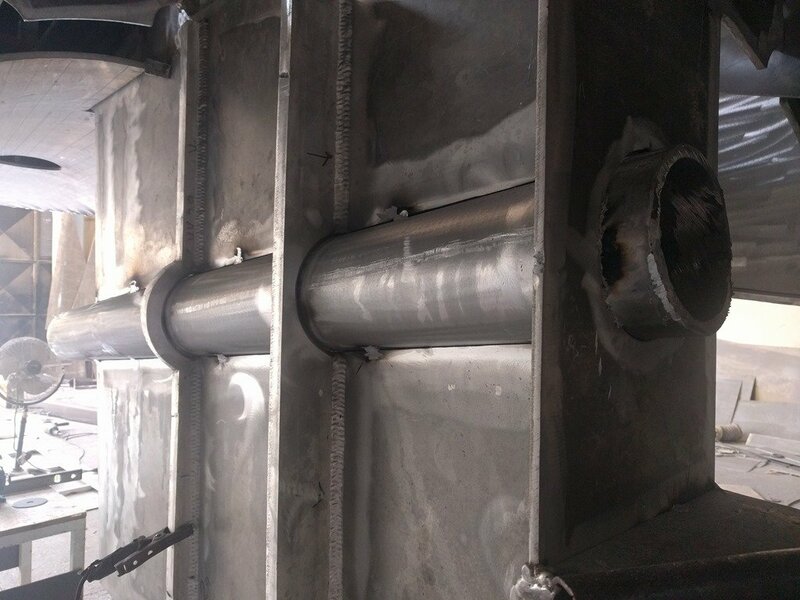 The aft most tunnel plate is lifted in place and mechanical jacks are used to carefully move this complex plate into just the right position on all axis. 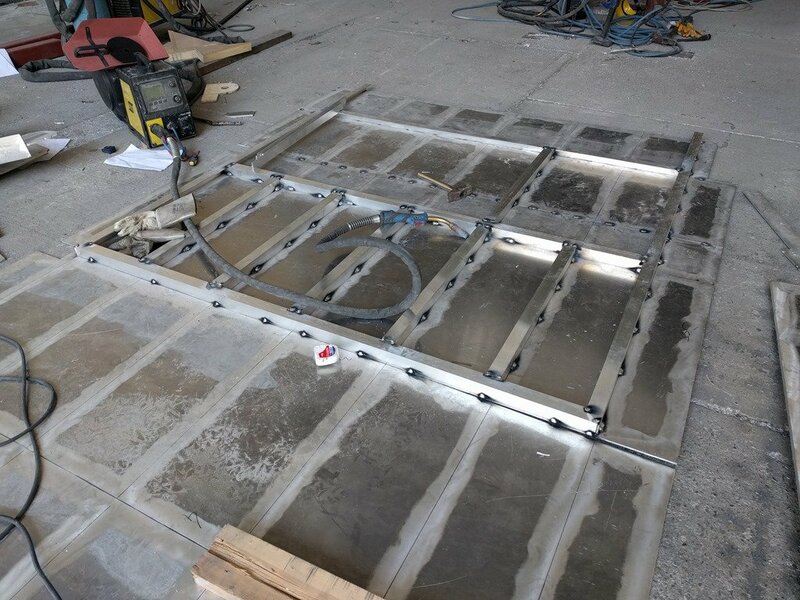 With everything lined up the tunnel plate is tacked in place to the 25mm thick frames on the inside. This is quite a tricky plate to fit as you can see here. 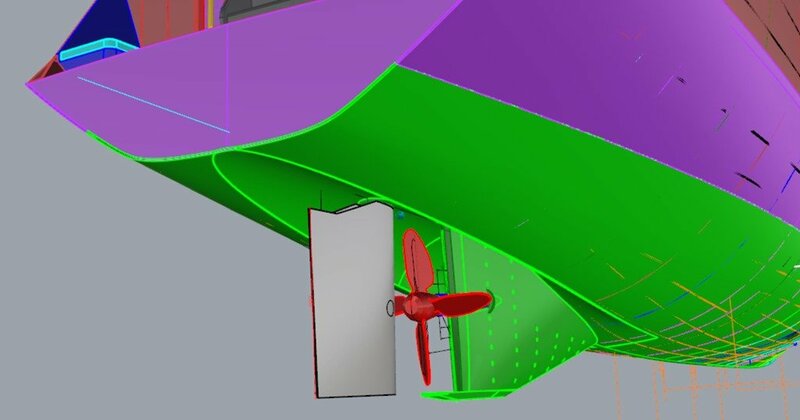 To assure that everything aligns the CNC cut slot slides over the aft vertical web of the skeg. 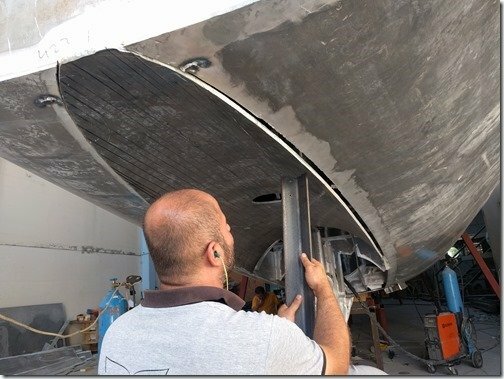 Then the outer edges of the tunnel plate are lifted up tight against the edges of the curved cut out in the hull plates until they are flush and tacked to hold them there. 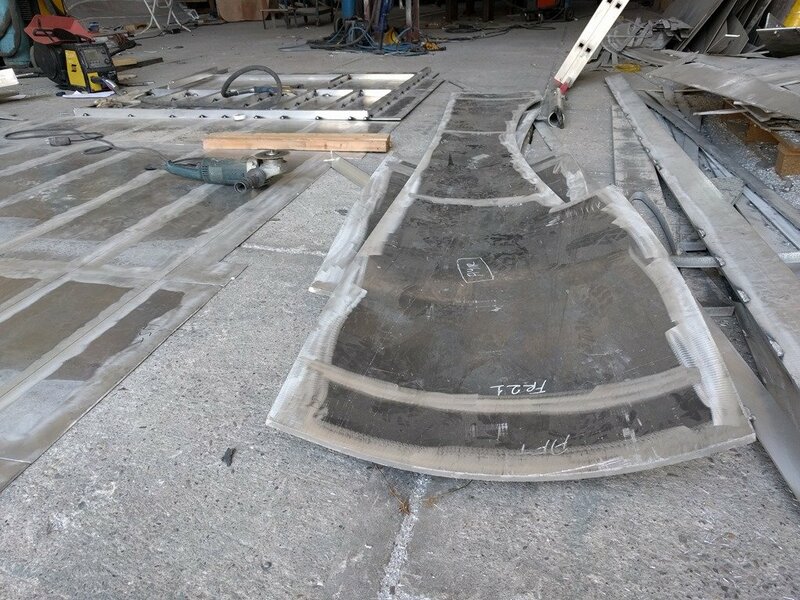 Next week these two complex curved plates will form the rest of the tunnel going forward and create the carefully engineered transition from the convex shape of the hull to the concave tunnel. 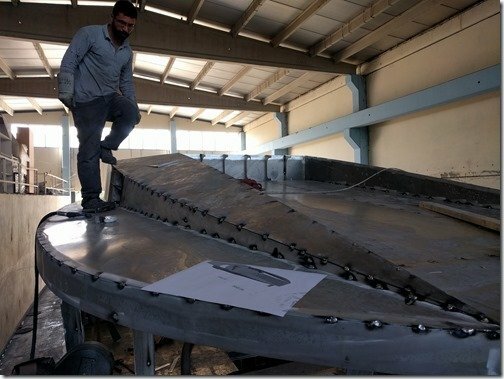 The curved cut outs on the top right edges are where these tunnel plates fit around the foil shaped curves of the skeg. Further aft on the shop floor Uğur and Nihat putting together the walls that will form the enclosure around the Gardner Engine Room. 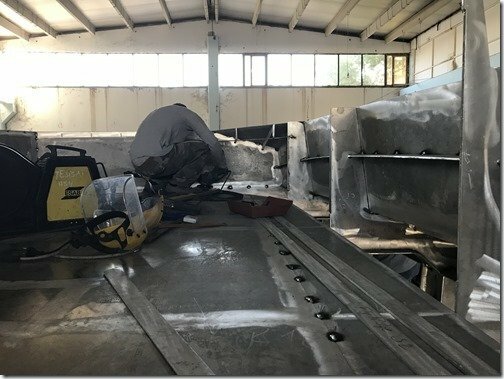 Rather than creating a full width Engine Room by running a bulkhead across the whole beam/width of the hull as is common, we have decided to create a smaller Engine Room Enclosure that wraps around the Gardner and Nogva CPP servo box to create a smaller dedicated Engine Room. 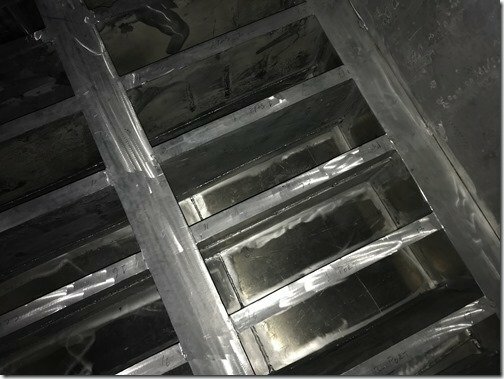 We can ventilate this ER Enclosure very thoroughly, keep it cooler and isolate engine heat, noise and vibration to just this space. 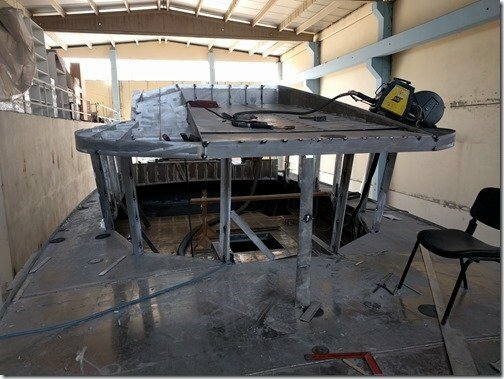 There is still plenty of room to easily walk around all sides of the Gardner and the two “hallways” created between the outsides of the ER Enclosure and the hull provides excellent spaces for workbenches and places to mount other equipment such as the Day Tank, water maker, Alfa Laval fuel centrifuge and more. 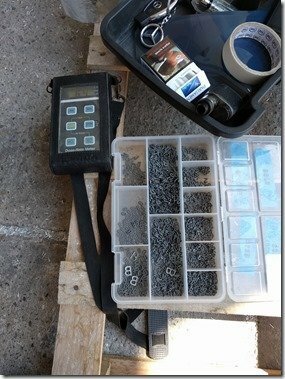 This also let’s me keep engine related equipment such as fuel filters, batteries, pumps, etc. al outside of the ER and away from all that heat and vibration so everything works better, lasts longer and is much easier to work on and maintain. 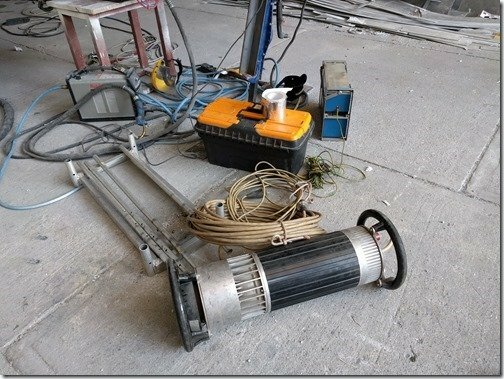 Can you guess what this equipment is for?? 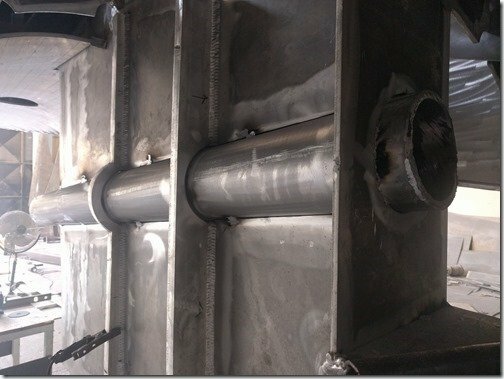 This black and silver cylindrical part looked to me like it had been brought over from some 1950’s science fiction movie set. The partially welded Day Tank was put onto a rolling table cart to help position that cylinder the right distance from the hull. 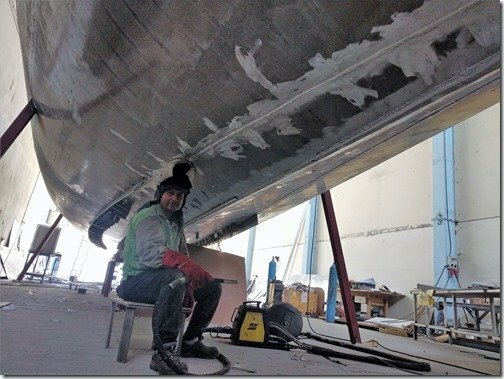 On the inside Master Welder Sezgin and this visiting expert were carefully positioning these rectangles of black plastic film and taping them over welds along the whole length of the hull in about 20 places. 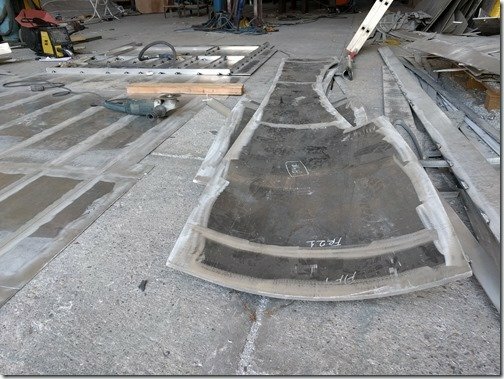 Then similar sized plastic rectangles were taped in the same spots on the outside of the hull plates. 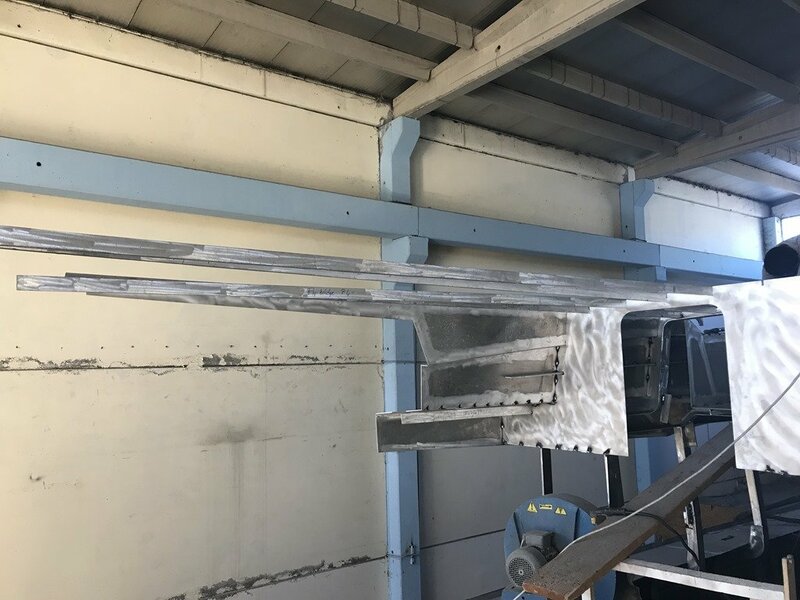 A beam of light from the cylinder was used to aim it at the center of these outer plastic rectangles and little wooden wedges were used to hold the steering wheel like ends of the mystery cylinder in that position. Next, various bits of data were entered into this control box. 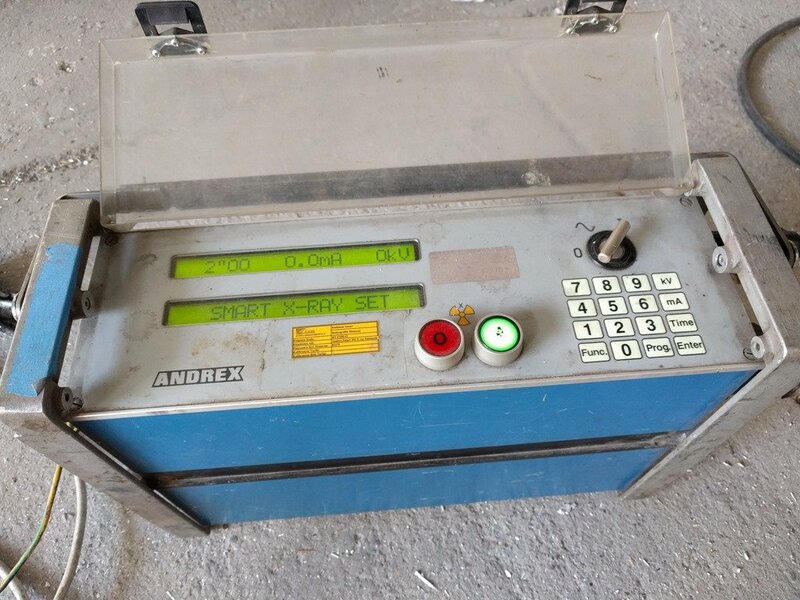 Everyone in the shop area was moved outside along with the mystery guest expert who carried this remote control in his hands and the pressed the buttons. 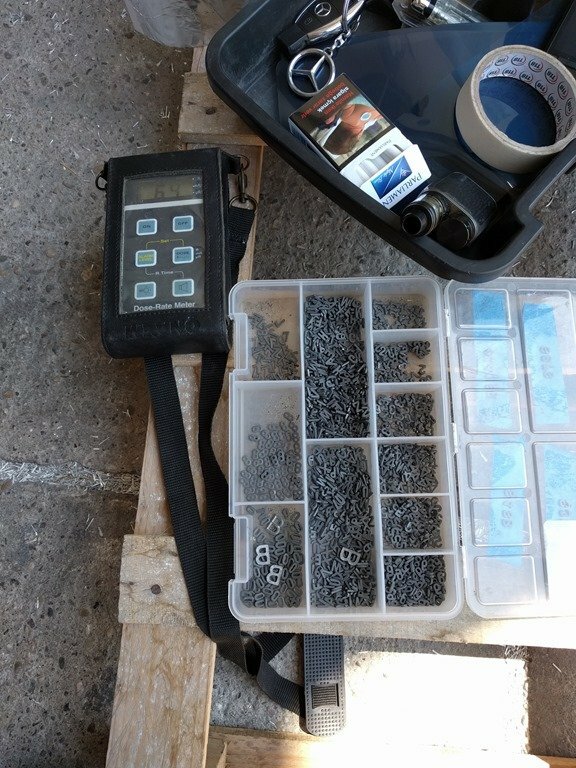 Would it help if I told you that this plastic divider box is full of small lead numbers and letters of the alphabet which the mystery guest carefully taped to the outer plastic rectangles? Or does the acronym NDT ring any bells for you? CORRECT!! 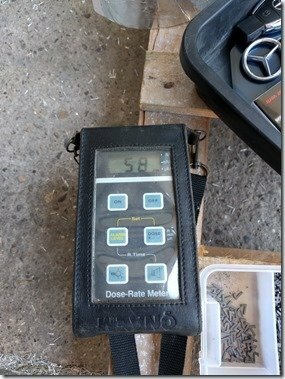 It was time for the first set of Non Destructive Testing aka NDT of the welds! This is the X-Ray machine you’ve been seeing and hence the safety issues of keeping everyone clear while X-Rays are momentarily present. Remember how your dentist used to step out of the room when they were X-Raying your teeth? Same thing here. 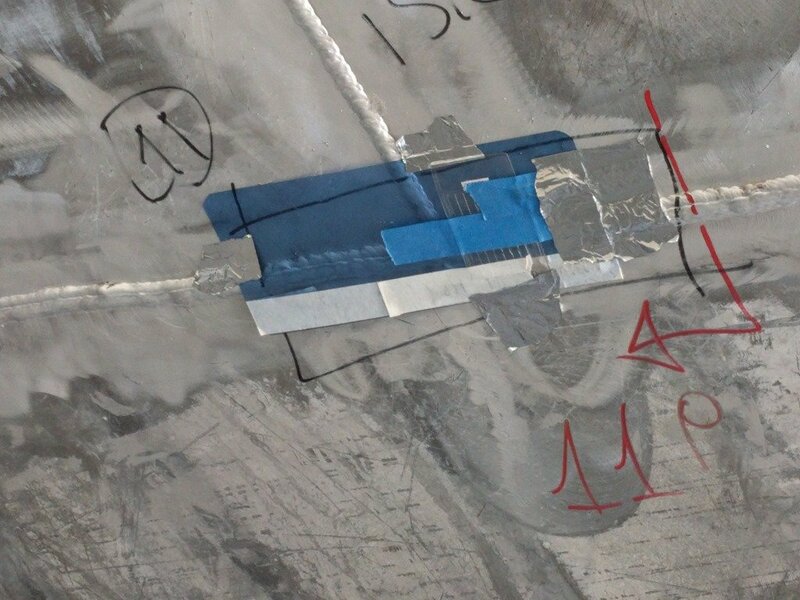 Those lead letters and numbers were taped to each plate with the plate #, Möbius and other identifying information that appears on each developed film plate. 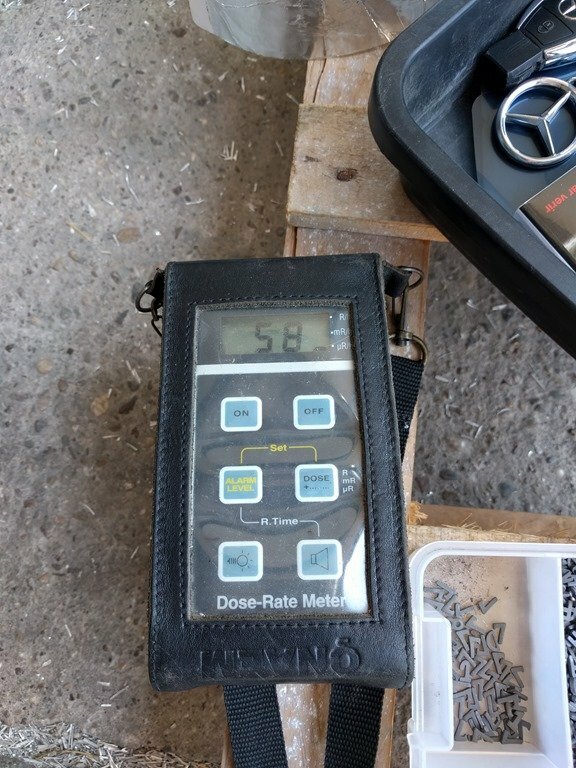 Other forms of NDT are being used as well to check for things like porosity and we will have the results back in the next few days. 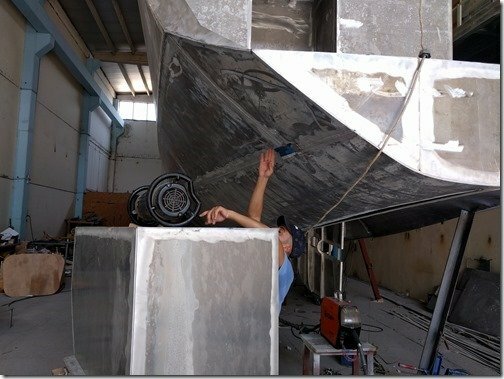 OK, let’s climb up on top and explore the various compartments of Möbius now that she is right side up. 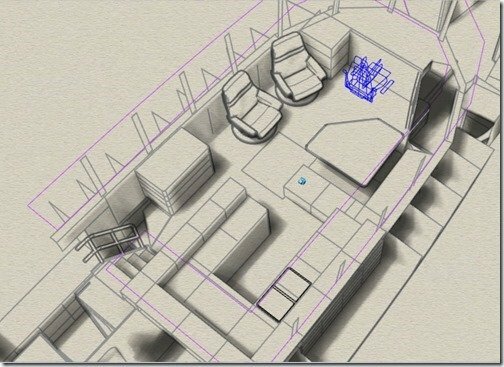 I’ll start wtih some very rough renderings of just the interior cabinetry to give you an initial orientation of where things are and how the living spaces fit together and then I will let you watch the videos at the end for a tour through these spaces as they exist in very rough form right now. 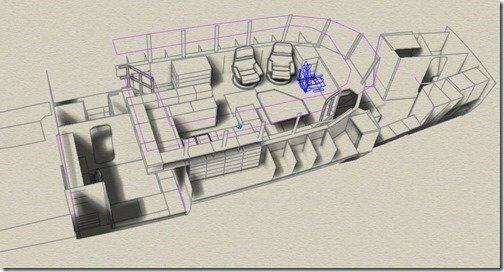 I’ve turned off everything in the model but the interior cabinetry and this is an overall rendering of all three living spaces; the Pilot House or SuperSalon up top and in the center, Main Cabin forward on the right side and Christine’s Office and the Guest Cabin aft on the left. 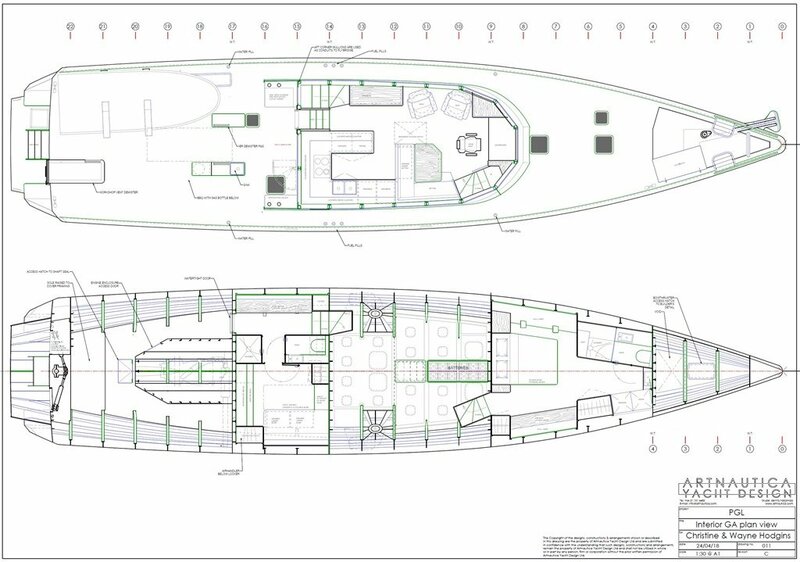 Zooming in a bit on the inside of the SuperSalon and moving counter clockwise from the bottom corner is the Galley with the Dining area forward and adjacent, stairs down to Master Cabin, Main Helm chair in blue front and center, Lounge Chairs upper corner and along Port side, cabinet of drawers at the base of the stairs coming down from the aft deck WT entrance and the stairs going down to Christine’s Office and the Engine Room/Workshop access. We have changed the layout of the Galley cabinets to have a cabinet and countertop running along the back of the adjoining Dining table seat back but not had time to update this model yet. 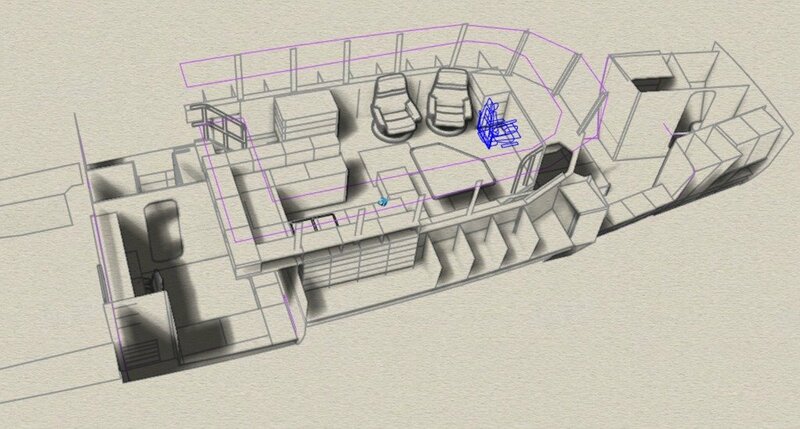 This looking from the Port (left) side into our Master Cabin. Moving clockwise from the Queen walk around bed bottom right, shower and head lower left, washer/dryer and wardrobe closets upper left and a series of drawers and cabinets along the walkway for the rest of the Starboard side to the doorway coming down from the SuperSalon. 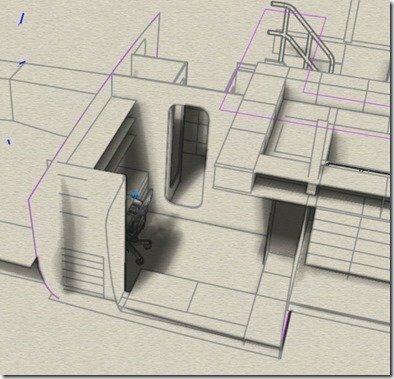 It is difficult to capture from any one angle but this is looking from the Stbd/right side into Christine’s Office and the Guest Cabin. 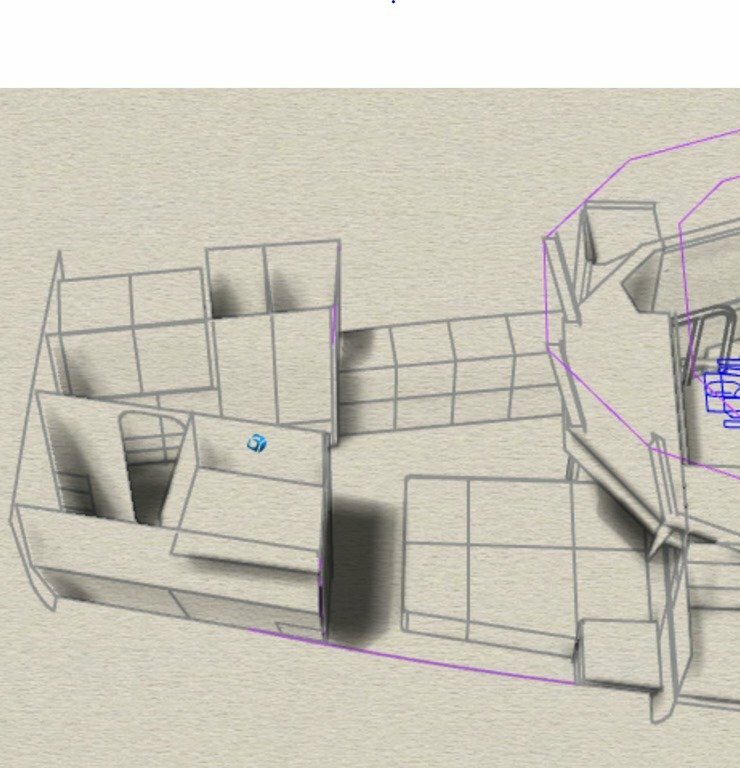 You are seeing the inside of a large full height wardrobe in the bottom left corner of this shot with a pull out Queen bed to the right along the hull which will also have a fold out Pullman bund above. 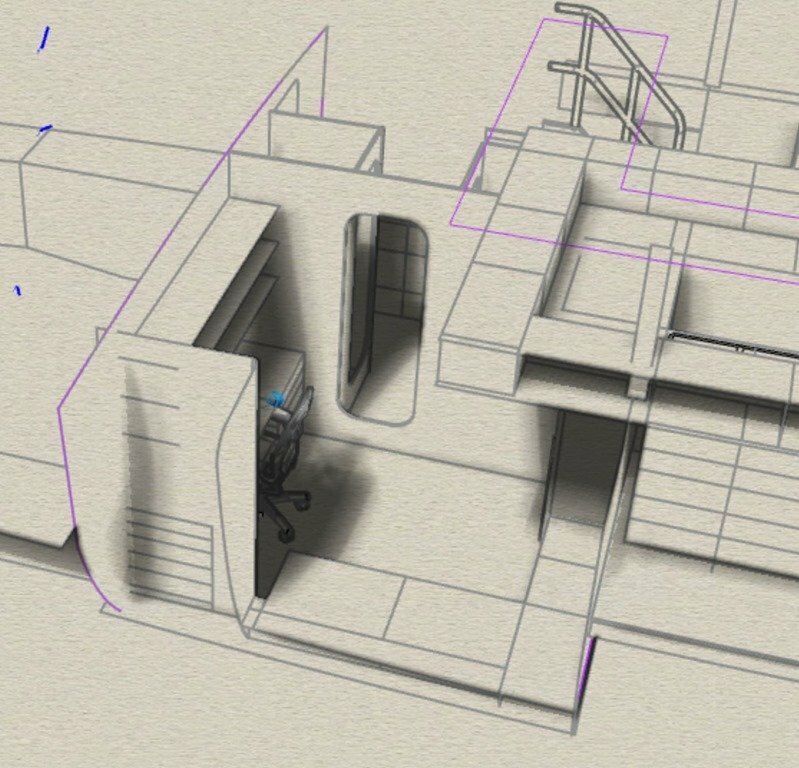 Christine’s Office desk and chair can just be seen to the left of the wardrobe running along the Engine Room wall and the doorway on the right side of her desk leads to the shower on the left and head/toilet on the right. This also leads into the short hallway that connects the stairs down from the SuperSalon on the right to the Engine Room/Workshop WT door on the left. 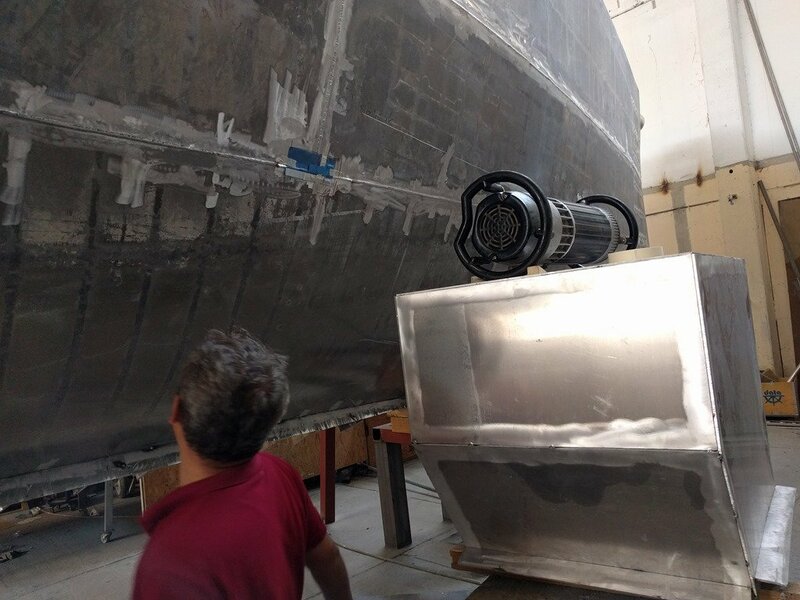 This side section will give you a sense of the scale of things and how the different levels work. Each of the numbered frames are 1 meter apart and there are several 180cm/ 5’ 11” human figures to give you an idea of headroom. 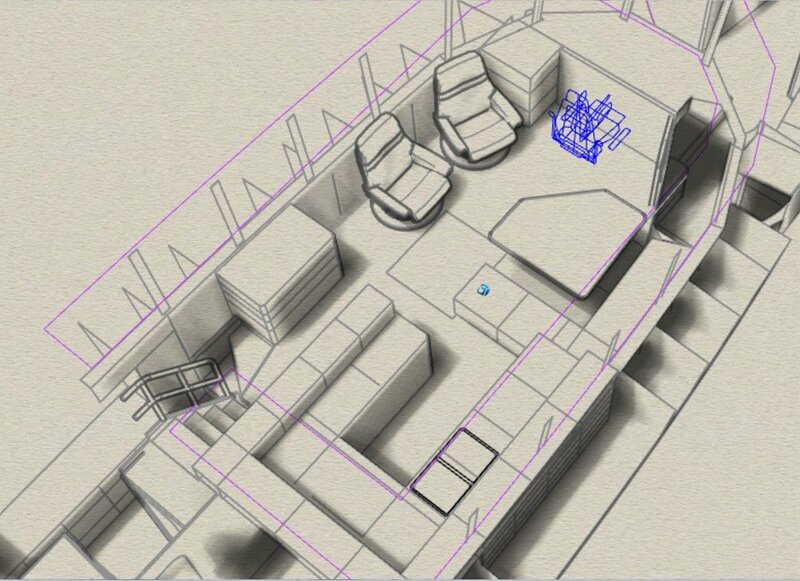 These plan views of the two floor levels show the scale and layout of the interior spaces. 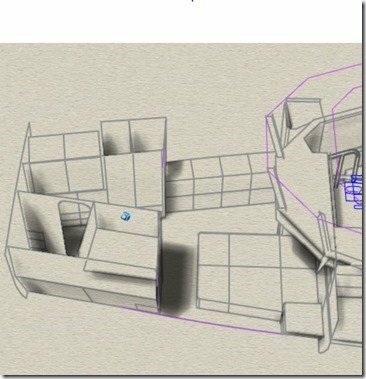 As in the rendering above the Galley counter against the Dining table seat back has not been added to this drawing yet. 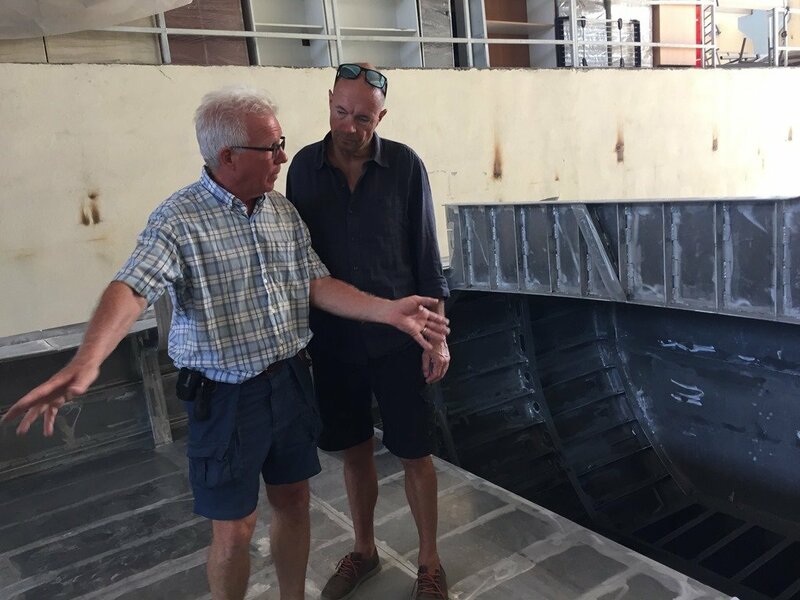 The real thrill this week though was a long overdue visit with our dear friend Philip who made a slight detour from Switzerland back to his boat in New Caledonia via Antalya. Philip and I serendipitously met back in 2009 when we were both single handing our sailboats around the world and were waiting to check into Ecuador. We had lunch together and have become best of friends in the years that followed as our wakes continued to cross and we shared many anchorages throughout the entire South Pacific. 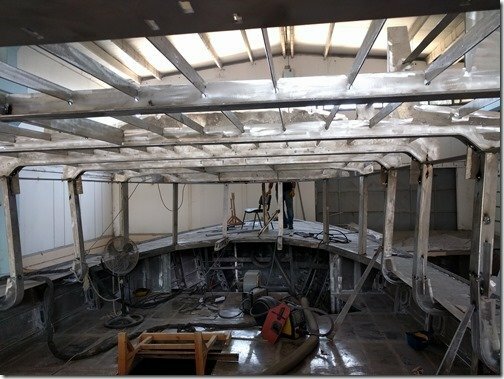 I had Philip and Christine aboard for both of their first tours of the inside of a right side up Möbius and Philip snapped this shot along the way with us standing in the SuperSalon about where the Lounge area will be. Thanks for a GREAT visit Philip hope you can make it back before or for the launch around the end of next year. This week’s video below is much longer than usual as they are running in real time rather than the usual 4-8X speed I’ve used on the previous videos but I hope my guided tour will bring the interior spaces more to life for you as it is doing for us. Use the fast forward button as needed to get through them quicker if you get bored. 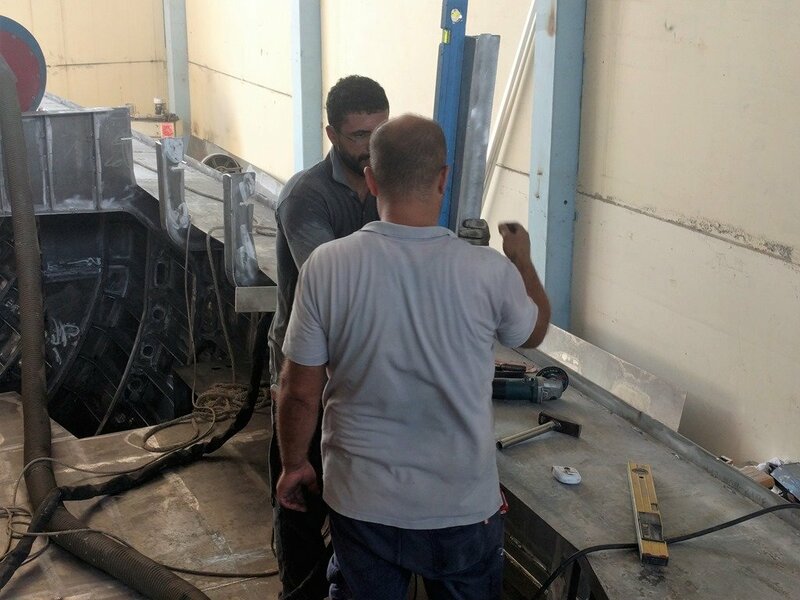 The week of August 20-24th was a big holiday here in Turkey as this marks the five day Hajj pilgrimage to Mecca in Saudi Arabia and pretty much all businesses, schools, banks and government agencies were all closed. We found this Q&A on the hajj pilgrimage to be very informative and provided a very good overview of the history and details of this important set of events and customs in the Muslim world. 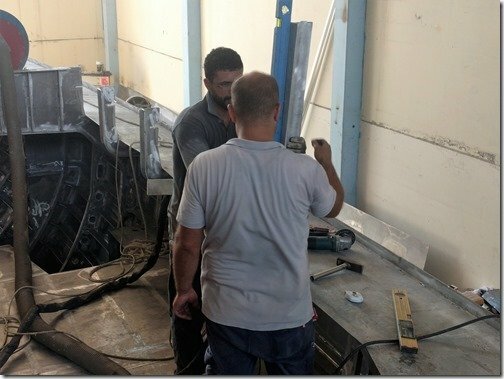 There is a lot of historical overlap with the Christian and Jewish history as the rites of hajj are believed to trace the footsteps of the prophets Ibrahim and Ismail, or Abraham and Ishmael as they are named in the Bible. As you can see in the picture above of the cube shaped Kaaba in the upper right area in the center of the the Grand Mosque in the Saudi Arabian city of Mecca it must be an amazing experience to be part of the re-enactment of the various activities around Mecca itself. Things were much more subdued and more life as usual here in Antalya. 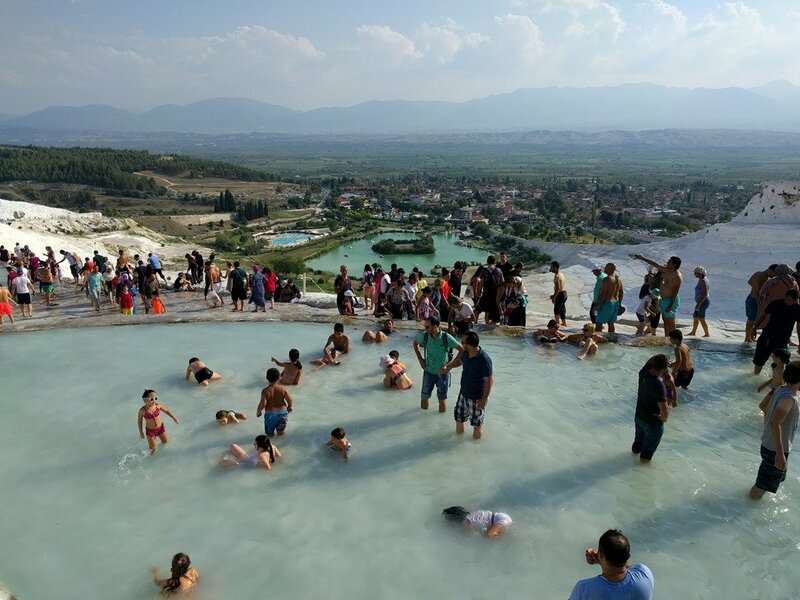 As we read up on the history and details of this week long series of events we wondered how those who lived in very densely populated urban areas such as here in Antalya follow some of the typical practices of this week. In urban areas this is a time when families gather for this holiday week and the final days of hajj coincide with Eid al-Adha, or the festival of sacrifice, celebrated by Muslims around the world to commemorate Ibrahim’s test of faith. 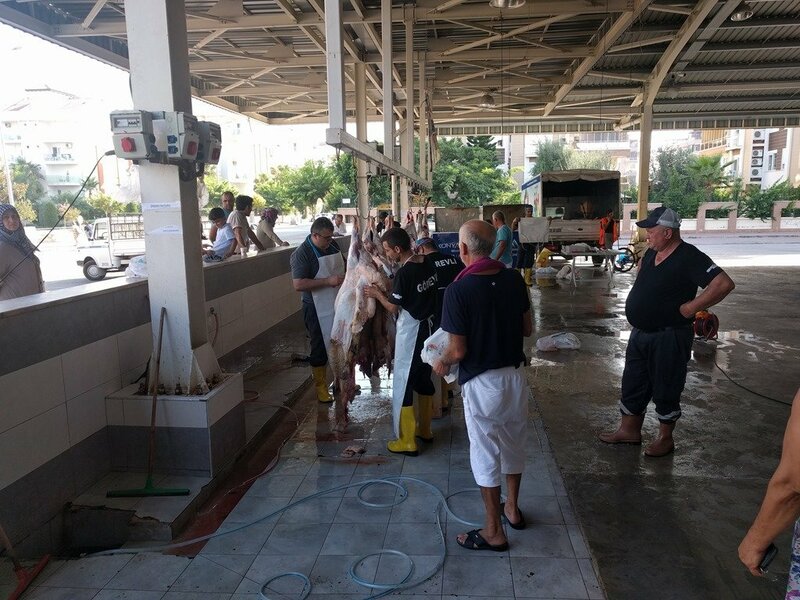 During the three-day Eid, Muslims slaughter livestock and distribute the meat to the poor. As we understand it some of the meat stays with the family that owns the animal’s owners and the rest goes to the community who look after distributing it to the less fortunate in the area. This all traditionally takes place on the Tuesday of the week which happens to be the day of the weekly fruit and vegetable market where Christine does most of our grocery shopping each week. But this week they shifted the market day to Monday and sure enough as we were bicycling over to the Mediterranean beach near us last Tuesday we rode by the big covered area where the market is centered and could see that people had brought quite a few sheep to this area in the back of their trucks. 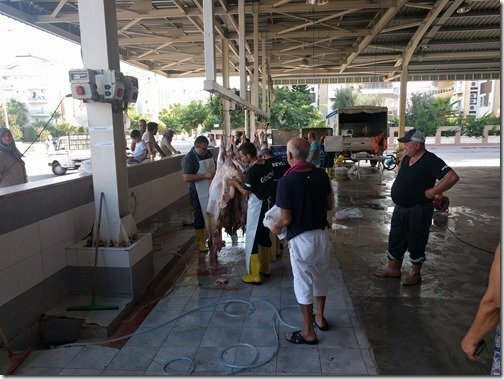 We stopped to check it out and were able to catch just the end of the whole process which as you can see was mostly down to the skinning and butchering of the sheep and then distributing this to community organisers and people in the area. Very fascinating and we will be sure to get there earlier next year so we can experience the whole event and buy some very fresh lamb to enjoy afterwards. 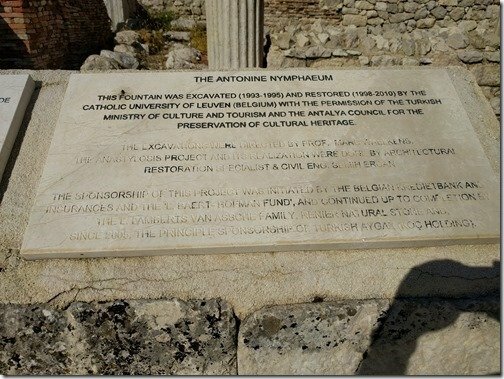 Christine and I used this pause in the building of Möbius as an opportunity to explore more of the areas around Antalya and thought you might like to see some of the sites we visited. I first came to Turkey for about a month back in 1982 on my BMW R100RS and my wife Diana on her R80T motorcycle, when I was teaching at the Canadian DND or Department of National Defense schools in Germany. 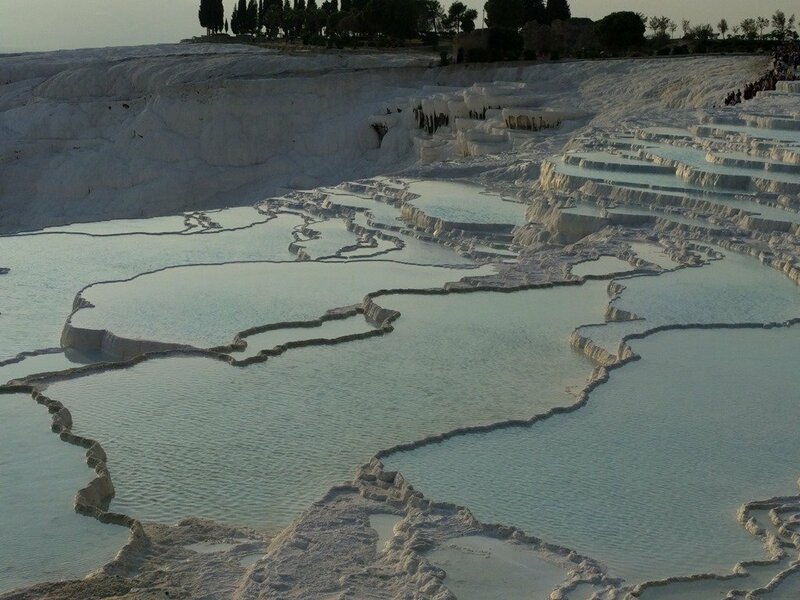 One of my most vivid memories was visiting the famous travertine terraces on the hillsides of the town of Pamukkale. As you can see Christine and I were not the only ones wtih this idea so the pools were a bit crowded but we were able to find places to get some of these more open shots. 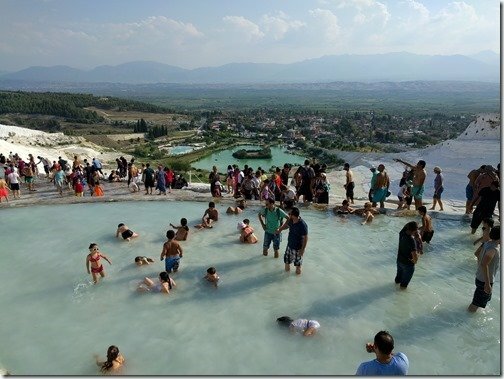 Christine found us a great little pension hotel right in the middle of the town of Pamukkale which is about a 3 hour drive North East from Antalya and we had a fabulous time cooling off in these other worldly pools and exploring some of the ruins and the museums from the past Roman and Ottoman empires. 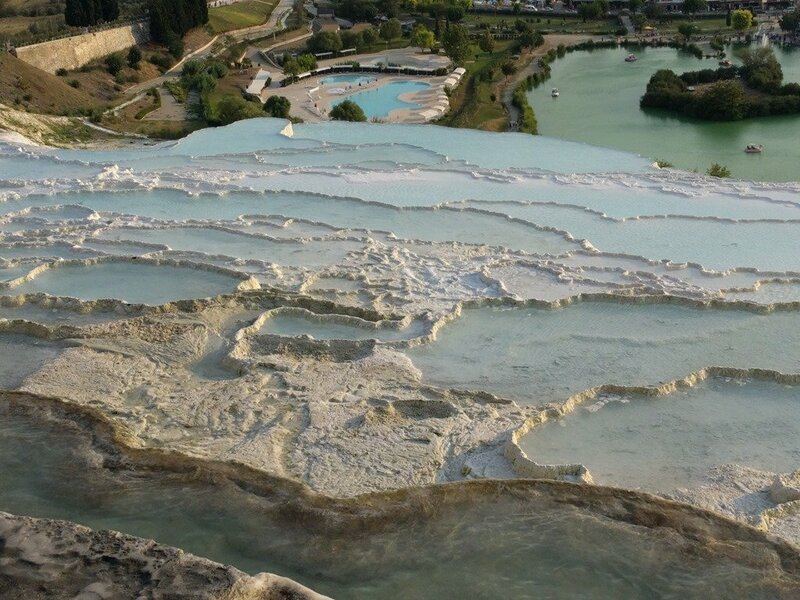 These naturally formed pools are most alien looking but oh so very beautiful. 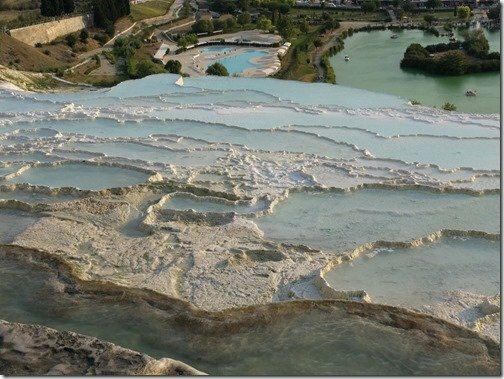 Above and behind the rock faces with all the travertine terrace pools were these remains of the Roman baths from a few years back and there were also a series of museums with artifacts from this area as well as an ancient pool area where the original mountain mineral stream still runs through and you can swim along some of its length and cool off. 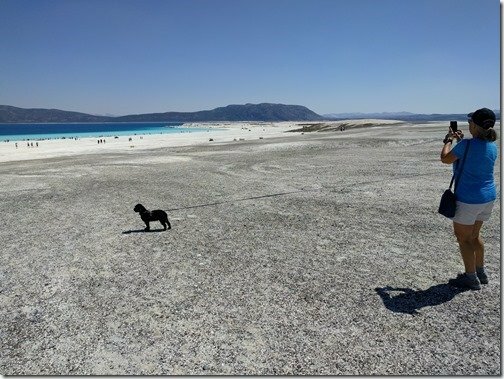 The next day we drove about an hour and a half South and West to another geographical wonder that is a crater formed Lake Salda in Burdur province. 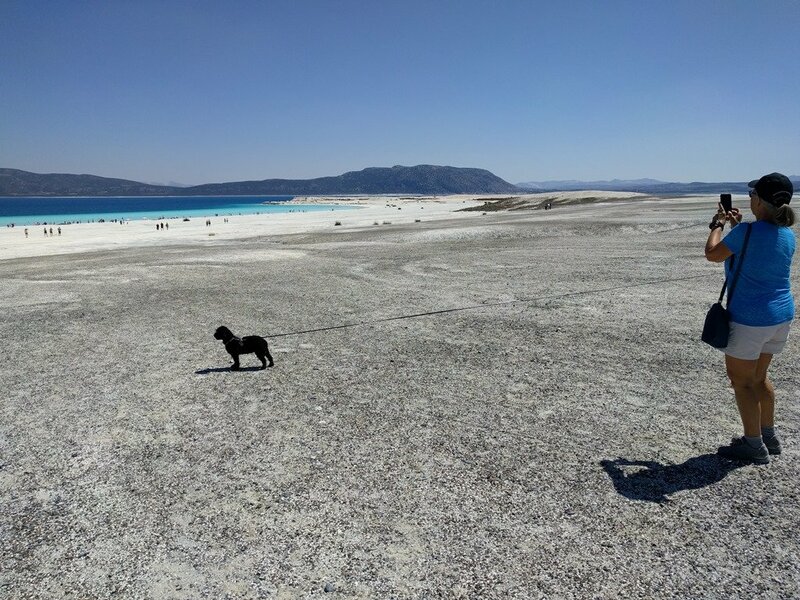 Ruby and Barney enjoyed being back on a beach and being able to cool off in the crystal blue waters and we did too as it was a very hot day. 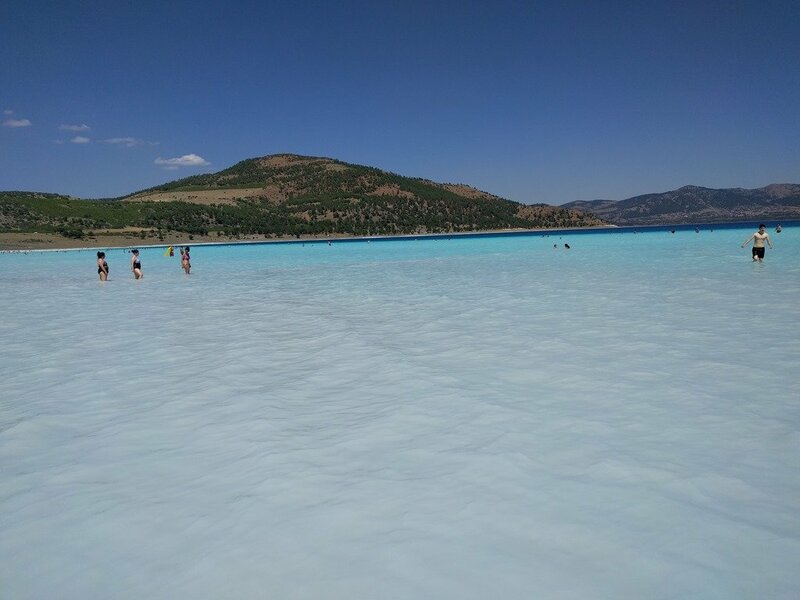 The sugar like white sand combined with the mineral rich waters gives the lake this very ocean like appearance in spite of it being a relatively small crater lake in the middle of the mountains. 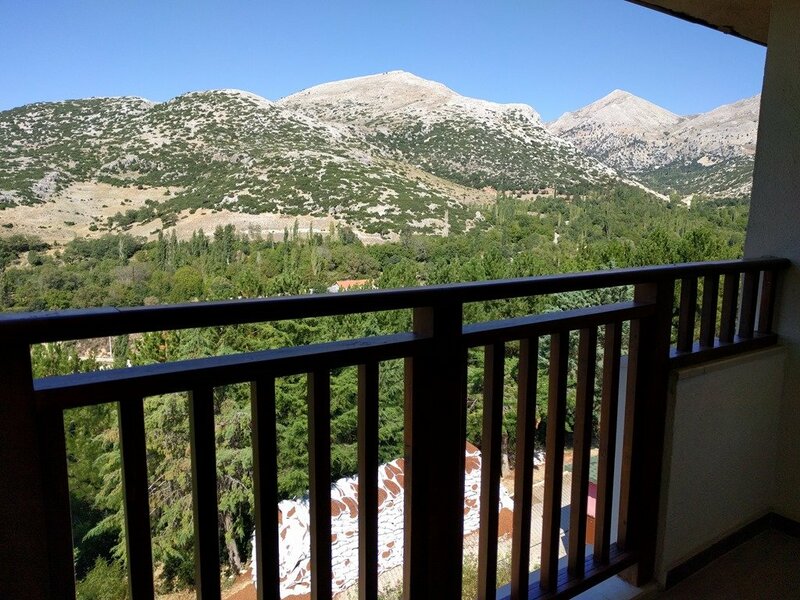 About an hour’s drive West from Salda took us to Christine’s real find of the trip, the Sagalassos Lodge & Spa. This is the view looking south from our room. We enjoyed time in the pool and later the included and delicious Turkish buffet, while Ruby and Barney enjoyed their air conditioned room and well pillowed bed. 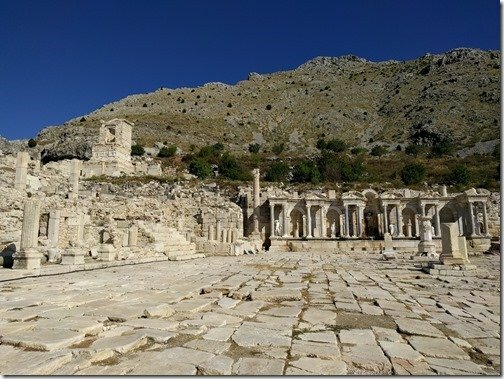 Next morning after enjoying the included breakfast at the Lodge and when it was a bit cooler we drove a few kilometers up the small gravel road from the lodge to see the archeological site of the ancient city of Sagalassos which is one of the best preserved ancient cities in Turkey. 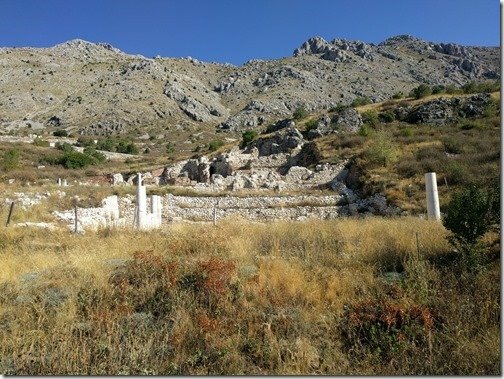 Human settlement goes back to 12.000 BC. 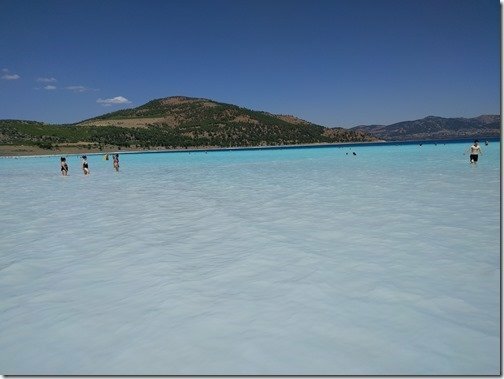 Other parts of its history are unknown until 334 BC. 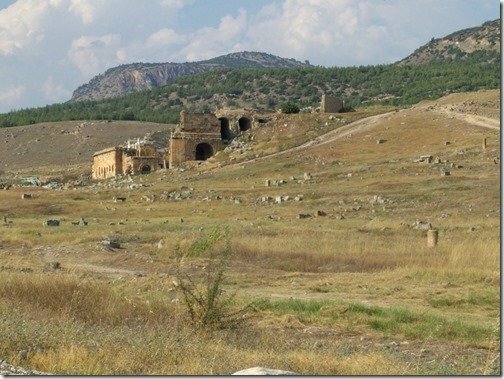 when Alexander the Great arrived and sacked the city. 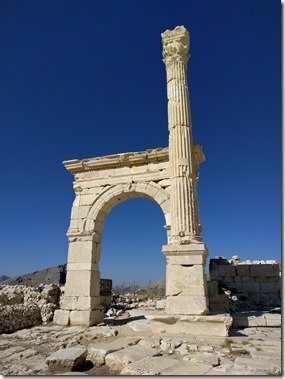 In 518 AD city was struck by a horrifying earthquake. 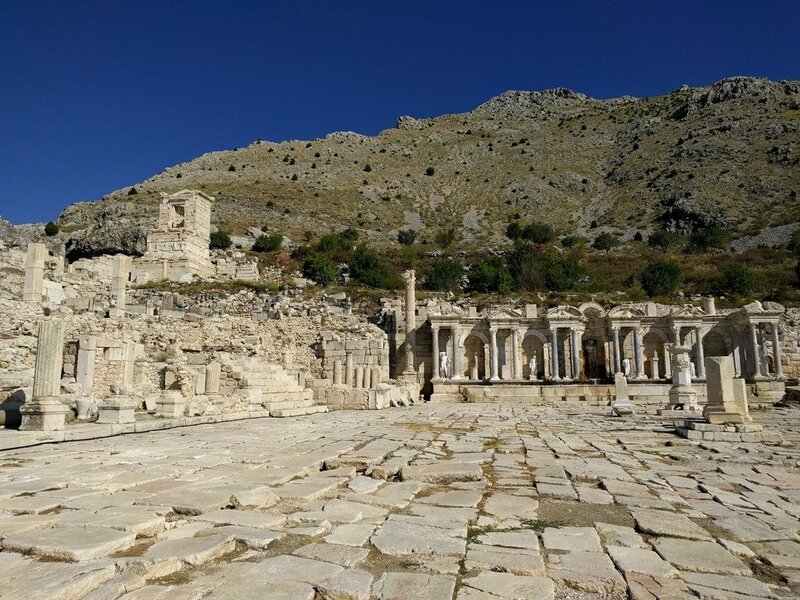 It was rebuilt, but then another earthquake happened in the 7th century. 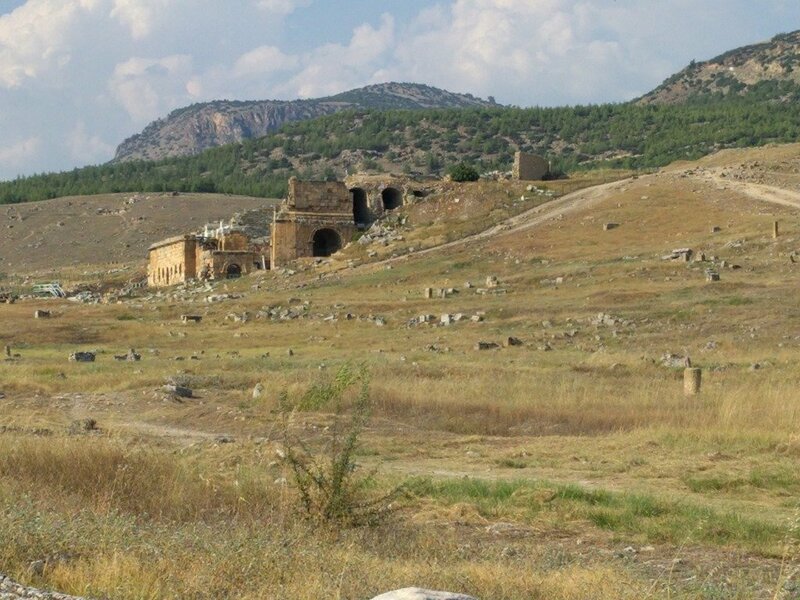 It destroyed the city’s water resources so it was abandoned. As is so often the case in our experiences wtih such sites in Turkey, we were the only ones there other than the 40 or so archeologists from several universities who were all busy working at digging out more items, cleaning and cataloging them and putting them back in their original locations and structures. In spite of being hit by several major earthquakes in the past, this Roman fountain and square have been put back together and was impressive to walk around. 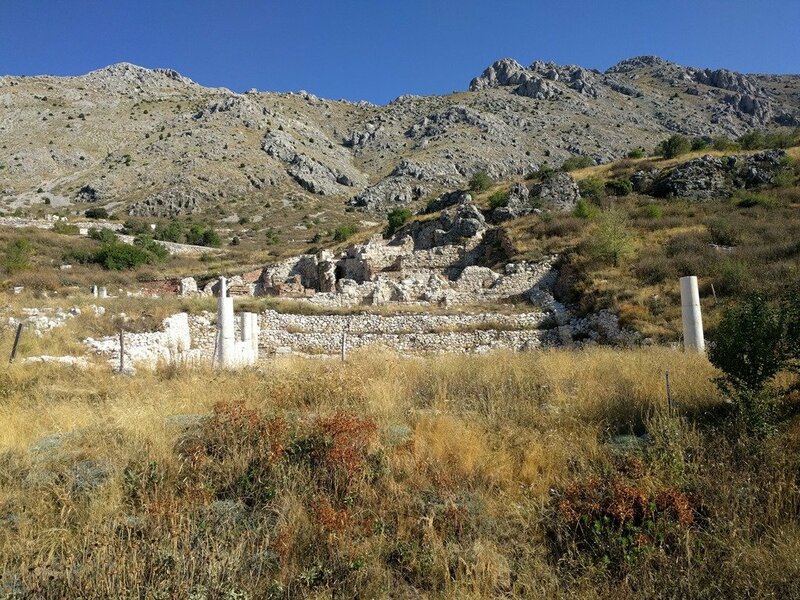 The original mountain sprint still feeds and fills the trough at the base of these arches and columns. 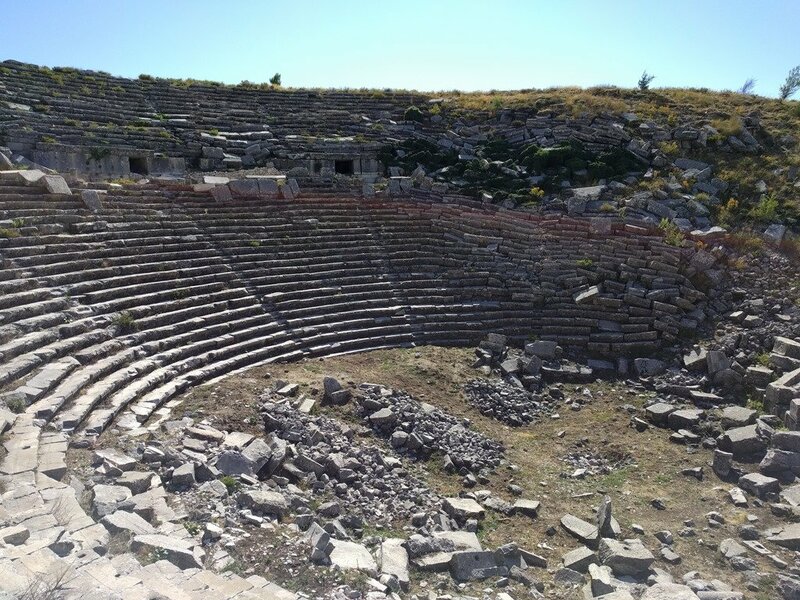 We hiked up the hill to the right of the town square to see the theatre which has not faired quite as well since the earthquakes and has not yet received the attention it deserves but was still impressive to see. 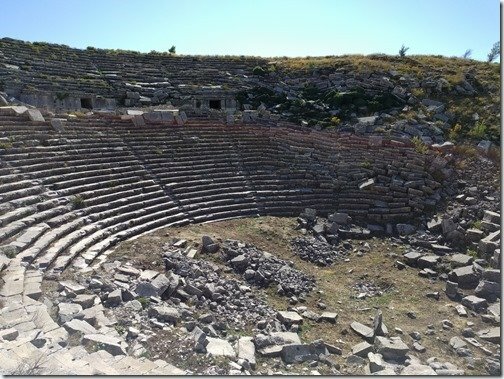 Being in such places I always find it fascinating to think that I am sitting on the same spot where some theatre attendee sat hundreds of years ago. 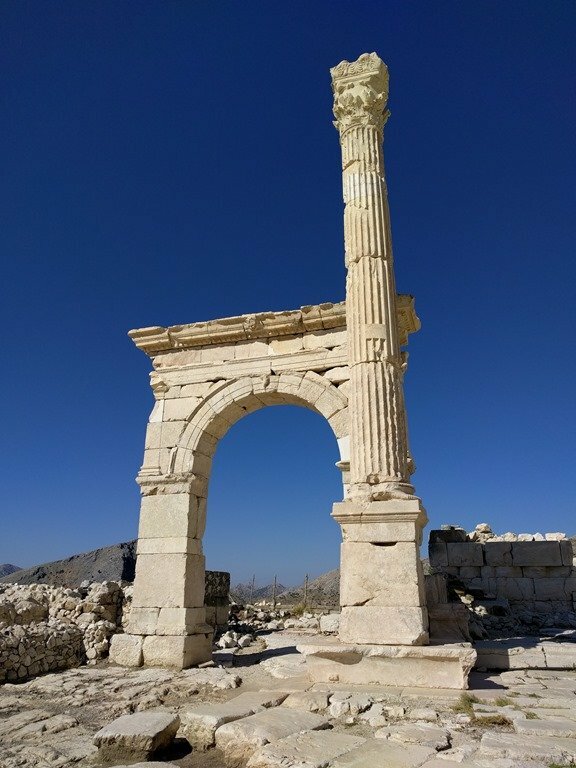 While much work remains to be done they have already pieced many of the major items such as this column and arch back together. As awemazing as all this was, the most special moment for me was reading this small plaque. 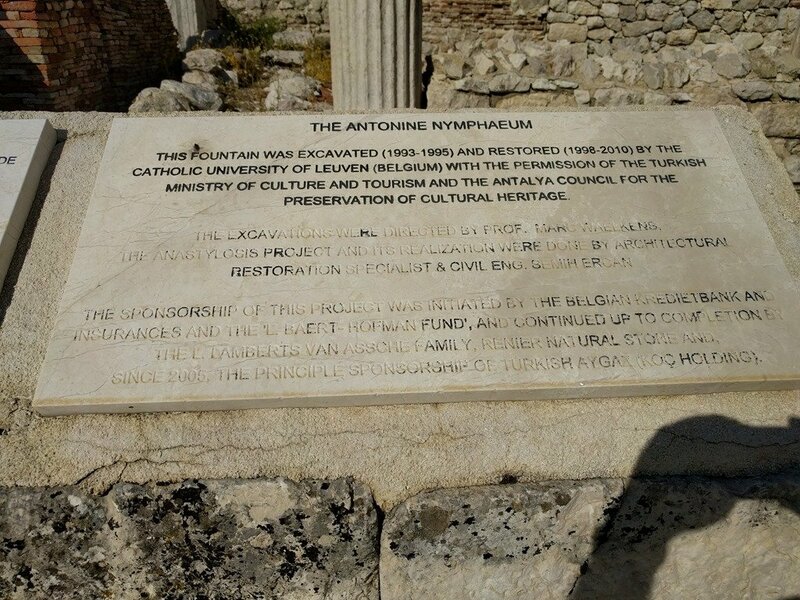 One of many spread throughout the site, explaining that this site has been excavated and restored by the Catholic University of Leuven, Belgium. Mildly interesting to most but I know this University VERY well by its native name of KU Leuven because it is where my dearest and unfortunately departed friend Professor Erik Duval was the head of the KU Leuven Human Interface Department. A very moving experience for me. 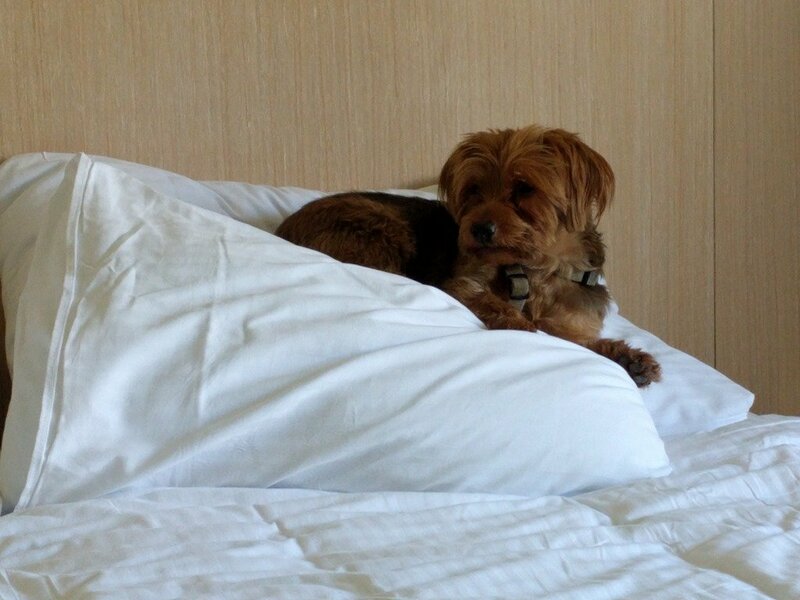 I miss you my friend.